Notre Dame is one of the most iconic and successful programs in college football. The school claims 11 national championships, but the NCAA recognizes the school with 13. Moreover, Notre Dame has 21 national championships recognized by all major selectors; this is tied with Alabama for the most in the FBS. Notre Dame, Oklahoma and Ohio State share the record of seven Heisman Trophy winners, but Notre Dame leads Ohio State by the number of individual winners. Notre Dame has produced 101 consensus All-Americans, 34 unanimous All-Americans, 52 members of the College Football Hall of Fame, and 13 members of the NFL Hall of Fame, all NCAA records. Notre Dame has had 495 players selected in the NFL Draft, second only to USC. All Notre Dame home games have been televised by NBC since 1991, and Notre Dame is the only school to have such a contract. It was the only independent program to be part of the Bowl Championship Series coalition and its guaranteed payout, and it has one of the largest, most widespread fan bases in college football. These factors help make Notre Dame one of the most financially valuable football programs in the country, which allows the school to remain an independent. Football did not have an auspicious beginning at the University of Notre Dame. In their inaugural game on November 23, 1887, the Irish lost to Michigan by a score of 8–0. Their first win came in the final game of the 1888 season when the Irish defeated Harvard Prep School of Chicago by a score of 20–0. At the end of the 1888 season they had a record of 1–3 with all three losses being at the hands of Michigan by a combined score of 43–9. Between 1887 and 1899 Notre Dame compiled a record of 31 wins, 15 losses, and four ties against a diverse variety of opponents ranging from local high school teams to other universities. In 1894, James L. Morison was hired as Notre Dame's first head football coach. Notre Dame took a significant step toward respectability, prominence, and stability when they hired Morison. He wrote an acquaintance after his first day on the job: “I arrived here [Notre Dame] this morning and found about as green a set of football players that ever donned a uniform… They want to smoke, and when I told them that they would have to run and get up some wind, they thought I was rubbing it in on them. “One big, strong cuss remarked that it was too much like work. Well, maybe you think I didn’t give him hell! I bet you a hundred no one ever makes a remark like that again.” Morrison had been hired for $40 plus expenses for two weeks. In 1908, the win over Franklin saw end Fay Wood catch the first touchdown pass in Notre Dame history. Notre Dame continued its success near the turn of the century and achieved their first victory over Michigan in 1909 by the score of 11–3 after which Michigan refused to play Notre Dame again for 33 years. By the end of the 1912 season they had amassed a record of 108 wins, 31 losses, and 13 ties. Rockne running for a touchdown against Army, 1913. Jesse Harper became head coach in 1913 and remained so until he retired in 1917. During his tenure the Irish began playing only intercollegiate games and posted a record of 34 wins, five losses, and one tie. This period would also mark the beginning of the rivalry with Army and the continuation of the rivalry with Michigan State. In 1913, Notre Dame burst into the national consciousness and helped to transform the collegiate game in a single contest. In an effort to gain respect for a regionally successful but small-time Midwestern football program, Harper scheduled games in his first season with national powerhouses Texas, Penn State, and Army. On November 1, 1913, the Notre Dame squad stunned the Black Knights of the Hudson 35–13 in a game played at West Point. Led by quarterback Gus Dorais and end Knute Rockne—who was soon to be legendary coach—the Notre Dame team attacked the Cadets with an offense that featured both the expected powerful running game but also long and accurate downfield forward passes from Dorais to Rockne. This game has been miscredited as the invention of the forward pass. Prior to this contest, receivers would come to a full-stop and wait on the ball to come to them, but in this contest, Dorais threw to Rockne in stride, changing the forward pass from a seldom-used play into the dominant ball-moving strategy that it is today. 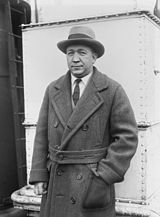 Irish assistant Knute Rockne became head coach in 1918. Under Rockne, the Irish would post a record of 105 wins, 12 losses, and five ties. The 105 wins account for 12.3% of all wins in Notre Dame football history. During his 13 years, the Irish won three national championships, had five undefeated seasons, won the Rose Bowl in 1925, and produced players such as George Gipp and the "Four Horsemen". Knute Rockne has the highest winning percentage (.881) in NCAA Division I/FBS football history. Rockne's offenses employed the Notre Dame Box and his defenses ran a 7–2–2 scheme. Rockne took over in the war-torn season of 1918 and posted a 3–1–2 record; he lost only to the Michigan Agricultural Aggies. He made his coaching debut on September 28, 1918, against Case Tech in Cleveland, Ohio and earned a 26–6 victory. Leonard Bahan, George Gipp, and Curly Lambeau were in the backfield. With Gipp, Rockne had an ideal handler of the forward pass. The 1919 team had Rockne handle the line and Gus Dorais handle the backfield. The team went undefeated and won the national championship. Gipp died at age 25 on December 14, 1920, just two weeks after Walter Camp elected him as Notre Dame's first All-American. Gipp likely contracted strep throat and pneumonia while giving punting lessons after his final game on November 20 against Northwestern. Since antibiotics were not available in the 1920s, treatment options for such infections were limited and they could be fatal even to young, healthy individuals. Rockne was speaking to Gipper on his hospital bed when he was purported to have delivered the famous, "Win one for the Gipper" line. John Mohardt led the 1921 Notre Dame team to a 10–1 record with 781 rushing yards, 995 passing yards, 12 rushing touchdowns, and nine passing touchdowns. Grantland Rice wrote that "Mohardt could throw the ball to within a foot or two of any given space" and noted that the 1921 Notre Dame team "was the first team we know of to build its attack around a forward passing game, rather than use a forward passing game as a mere aid to the running game." Mohardt had both Eddie Anderson and Roger Kiley at end to receive his passes. The 1926 team beat Army and was led by Christie Flanagan. For all his success, Rockne also made what an Associated Press writer called "one of the greatest coaching blunders in history." Instead of coaching his team against Carnegie Tech, Rockne traveled to Chicago for the Army–Navy Game to "write newspaper articles about it, as well as select an All-America football team." Carnegie Tech used the coach's absence as motivation for a 19–0 win; the upset likely cost the Irish a chance for a national title. The 1928 team lost to national champion Georgia Tech. "I sat at Grant Field and saw a magnificent Notre Dame team suddenly recoil before the furious pounding of one man–Peter Pund," said Rockne. "Nobody could stop him. I counted 20 scoring plays that this man ruined." Among the events that occurred during Rockne's tenure none may be more famous than the Rockne's Win one for the Gipper speech. Army came into the 1928 matchup undefeated and was the clear favorite. Notre Dame, on the other hand, was having their worst season under Rockne's leadership and entered the game with a 4–2 record. At the end of the half Army was leading and looked to be in command of the game. Rockne entered the locker room and gave his account of Gipp's final words: "I've got to go, Rock. It's all right. I'm not afraid. Some time, Rock, when the team is up against it, when things are going wrong and the breaks are beating the boys, tell them to go in there with all they've got and win just one for the Gipper. I don't know where I'll be then, Rock. But I'll know about it, and I'll be happy." The speech inspired the team and they went on to upset Army and win the game 12–6. The 1929 and 1930 teams both went undefeated, winning national championships, and the 1930 team was led by the likes of Frank Carideo, Joe Savoldi, Marchy Schwartz and Marty Brill. It featured the first and only example of all four members of a backfield being named to an All-American team during the same season. The 1929 team played all of its games on the road while the new Notre Dame Stadium was being built. In 1930, "Jumping Joe" Savoldi scored the first Notre Dame touchdown in the new stadium on a 98-yard kickoff return. Savoldi is also known as "the first hero in the lore of Notre Dame's Stadium" based on scoring three touchdowns in the official stadium dedication game against Navy the following week. Rockne coached his last game on December 14, 1930, when he led a group of Notre Dame all-stars against the New York Giants in New York City. The game raised funds for the Mayor's Relief Committee for the unemployed and needy of the city. 50,000 fans turned out to see the reunited "Four Horsemen" along with players from Rockne's other championship teams take the field against the pros. On March 31, 1931, Rockne died at age 43 in the crash of a Transcontinental & Western Air airliner in Kansas; he was on his way to help in the production of the film The Spirit of Notre Dame. The crash site is located in a remote expanse of Kansas known as the Flint Hills and now features a Rockne Memorial. As Notre Dame's head coach from 1918 to 1930, Rockne posted what has remained for decades the all-time highest winning percentage (.881) for a football coach in the NCAA's flagship FBS division. During his 13-year tenure as head coach of the Fighting Irish, Rockne collected 105 victories, 12 losses, 5 ties and 3 national championships. Rockne also coached Notre Dame to 5 undefeated and untied seasons. Through game broadcasts during the Golden Age of Radio, Notre Dame football gained a nationwide following of "subway alumni", Catholics who became fans whether or not they attended the university. Former Saint Louis head coach Heartley "Hunk" Anderson was promoted from assistant coach and took the helm of the Irish after Knute Rockne's death, leading them to a record of 16 wins, nine losses, and two ties. Anderson was a former Irish player under Rockne and was serving as an assistant coach at the time of Rockne's death. Anderson resigned as Irish head coach after the 1933 season to accept the position of head football coach at NC State. Notre Dame finished 6–2–1 in 1931. The Irish began the season with a 25–0 win over Indiana, Notre Dame tied Northwestern in the season's second game. Anderson's squad then demolished Drake by a score of 63–0. After defeating Pittsburgh by a score of 25–12, the Fighting Irish shut out their next three opponents; Carnegie Mellon, Pennsylvania and Navy. The Irish lost a heartbreaker by a score of 16–14 to USC on November 21 that snapped the Irish's 26-game non-losing streak. Army shut out the Irish by a score of 12–0 on November 28 to finish the Irish's season. The Irish went 7–2 in 1932. Anderson's team began with three blowout victories; 73–0 over Haskell, 62–0 over Drake and 42–0 over Carnegie Mellon. The Irish then faced Pittsburgh in front of a then-record crowd of 62,000, losing by a score of 12–0. Notre Dame bounced back to win its next four; 24–6 over Kansas, 21–0 over Northwestern, 12–0 over Navy and 21–0 over Army in front of a new record crowd on 80,000. Anderson's Irish closed the season on a sour note, losing to USC by a score of 13–0. 1933 was a tough year for the Irish as they finished with a 3–5–2 record. Notre Dame began the season in a scoreless tie with Kansas. After defeating Indiana by a score of 12–2, ND suffered a four-game losing streak, failing to score a point in all four losses to Carnegie Mellon, Pittsburgh, Navy. and Purdue. Notre Dame ended the losing streak by defeating Northwestern by a score of 7–0. The Fighting Irish closed the season with a 19–0 loss to USC and a 13–12 win over Army. Anderson was replaced by Elmer Layden, who was one of Rockne's "Four Horsemen" in the 1920s. After graduating, Layden played professional football for one year and then began a coaching career. The Irish posted a record of 47 wins, 13 losses, and three ties in seven years under Layden, the most successful record of a Notre Dame coach not to win a national championship. He left Notre Dame after the 1940 season to become Commissioner of the National Football League. Layden's 1935 squad posted one of the greatest wins in school history by rallying to defeat Ohio State by a score of 18–13. His 1938 team finished 8–1, losing only to USC in the season finale. This loss cost them a possible consensus national championship, but the team was named national champion by the Dickinson System. Like Rockne before him, Layden was a goodwill ambassador for Notre Dame during his time as head coach. He was able to schedule a home-and-home series with Michigan after meeting with Fielding H. Yost, healing a rift between the two schools. The two teams had not met since 1909, when, after eight straight losses to the Wolverines, the Irish posted their first win. They were scheduled to meet again in 1910, but Michigan canceled the game and refused to play the Irish again. By the time they met again in 1943, Layden had left Notre Dame and Frank Leahy had taken his place. Unlike the easygoing Layden, Leahy was intense, and after the Irish had thrashed Michigan by a score of 35–12 in 1943, Wolverine coach and athletic director Fritz Crisler never scheduled the Irish again. 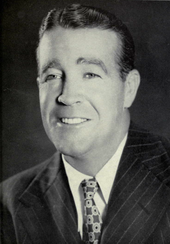 Boston College head coach Frank Leahy was hired by Notre Dame to take over for Layden in 1941, and was another former Irish player who played during the Rockne era. After graduating from Notre Dame, Leahy held several coaching positions, including line coach of the "Seven Blocks of Granite" of Fordham University that helped that team win all but two of their games between 1935 and 1937. He then coached the Boston College Eagles to a win in the 1941 Sugar Bowl and a share of the national championship. His move to Notre Dame began a new period of gridiron success for the Irish, and ensured Leahy's place among the winningest coaches in the history of college football. Leahy coached the team for 11 seasons, from 1941 to 1943 and 1946 to 1953. He has the second highest winning percentage (.864) of any college coach in history. He led the Irish to a record of 87 wins, 11 losses, and nine ties including 39 consecutive games without a loss (37–0–2), four national championships, and six undefeated seasons. 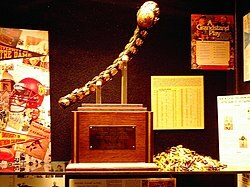 A fifth national championship was lost because of a 1953 tie against Iowa, in a game that featured 1953 Heisman Trophy winner Johnny Lattner that caused a minor scandal at the time, when it appeared that some Irish players had faked injuries to stop the clock, leading some to nickname those players the "Fainting Irish". From 1944 to 1945, Leahy served in the U.S. Navy during World War II and was honorably discharged as a Captain. Edward McKeever, Leahy's assistant coach, became interim head coach when Leahy left for the Navy. During his one year at the helm (1944) the Irish managed 8 wins and 2 losses. McKeever left Notre Dame in 1945 to take over as head coach of Cornell. He was replaced by Hugh Devore for the 1945 season who led the Irish to a 7–2–1 record. Leahy retired in 1954 reportedly due to health issues. Perhaps the best example of this occurred during the Georgia Tech game in 1953. Leahy fell ill during the game, which led to him collapsing during halftime. [self-published source] The situation was so dire that a priest was called in to give Leahy the last rites. However, Leahy recovered, and the consequent diagnosis was that he was suffering from nervous tension and pancreatitis. The departure of Frank Leahy ushered in a downward slope in Notre Dame's performance, referred to in various circles as a period of de-emphasis. 25-year old assistant coach Terry Brennan was hired as Frank Leahy's successor as the Notre Dame head coach in 1954 and would stay until 1958. When asked if he thought he was too young to be a head coach at the age of 25, Brennan replied, "Oh, I don't know. I'll be 26 in a few months." He departed with a total of 32 wins and 18 losses. But note: the 32 wins included 17 in 1954 and 1955. From 1956 to 1958 his record was 15–15. Brennan was a former player under Leahy and before joining the Irish had coached the Mount Carmel High School team in Chicago and later the freshman squad and assistant at Notre Dame. His first two seasons the Irish were ranked fourth and ninth respectively. It was the 1956 season that began to darken his reputation, for it became one of the most dismal in the team's history and saw them finish the season with a mere two wins, including losses to Michigan State, Oklahoma, and Iowa. One bright spot in the 1956 season was the awarding of the Heisman Trophy to Paul Hornung, who would go on to a legendary NFL career with the Green Bay Packers. To date, Hornung is the only Heisman winner to win the award while playing for a team that had a losing record. The Irish would recover the following season, posting a record of 7–3 and including in their wins a stunning upset of Oklahoma, in Norman, Oklahoma, that ended the Sooners' still-standing record of 47 consecutive wins. In Brennan's final season, though, the Irish finished 6–4. Brennan was fired in mid-December. Brennan's tenure can only be properly framed with the understanding that in a time of zero scholarship limitations in college football, Notre Dame's administration inexplicably began a process of deemphasizing football, severely cutting scholarships and hindering Brennan from building a roster of any meaningful depth. Former San Francisco, Chicago Cardinals and Washington Redskins head coach Joe Kuharich took the head coaching position at Notre Dame in 1959, realizing a longtime ambition to return to his alma mater. He had earlier been courted by Notre Dame after the 1956 season, after the Irish finished 2–8, but before he had a chance to accept an offer, Terry Brennan was given a reprieve. He brought a professional touch to Irish football, putting shamrocks on the players' helmets and shoulder stripes on their jerseys. Kuharich compiled a 17–23 record over four non-winning seasons and remains to this day the only coach ever to have an overall losing record at Notre Dame. Included was a school-record eight-game losing streak in 1960, a year in which the Irish finished 2–8. It was one of the worst stretches in program history. The consensus opinion was that Kuharich never made the adjustment from pro football to college football, attempting to use complicated pro coaching techniques with collegiate players, and never adapted to the limited substitution rules in effect at the time, having big, immobile linemen playing both ways in an era where smaller, quicker players were preferred. He often said, "You win some and you lose some", and seemed perfectly content finishing 5–5 every year. This did not sit well with the Irish faithful, who expected Notre Dame to beat everybody. When the pressure of winning became too much to bear, Kuharich resigned in the spring of 1963 and assumed the post of supervisor of NFL officials. Because it was so late in the spring, Hugh Devore was named head coach for the 1963 season while the search for a permanent replacement was being conducted. The players that he recruited came to within 93 seconds of an undefeated season and a national championship in 1964 under first-year coach Ara Parseghian. Despite his unsuccessful Notre Dame tenure, Kuharich remains the only Irish coach to post back-to-back shutouts over their greatest rival, the University of Southern California Trojans in 1960 (17–0) and 1961 (30–0). In 1964, Ara Parseghian left his job as the Northwestern head football coach when he was hired to take over the coaching duties at Notre Dame. He immediately brought the team back to a level of success in Irish football history that was comparable only to Rockne and Leahy. These three coaches have an 80% or greater winning percentage while at Notre Dame – Rockne at .881, Leahy at .864, and Parseghian at .836. Parseghian's teams never won fewer than seven nor lost more than three games during the ten game regular seasons of the era. In his first year, the Irish improved their record to 9–1, but they lost the national championship in the last game of the season at USC when Craig Fertig connected with a touchdown pass to Rod Sherman. Parseghian earned coach of the year honors from the American Football Coaches Association, the Football Writers Association, and The Sporting News, as well as several others, and a cover story in Time magazine. Parseghian was also named coach of the year by several selectors in his national championship years of 1966 and 1973 and was inducted into the College Football Hall of Fame in 1980. It was under Parseghian as well that Notre Dame lifted its 40-plus year-old "no bowl games" policy, beginning with the season of 1969, after which the Irish played the No. 1 Texas Longhorns in the Cotton Bowl Classic, losing in the final minutes in a closely contested game. The following year, Parseghian's 9–1 squad ended Texas' Southwest Conference record 30-game winning streak in the 1971 Cotton Bowl. During his eleven-year career, the Irish amassed a record of 95–17–4 and captured two national championships as well as the MacArthur Bowl in 1964. The Irish also had undefeated seasons in 1966 and 1973, had three major bowl wins in five appearances, and produced one Heisman Trophy winner (John Huarte in 1964). In 1971, Cliff Brown became the first African-American quarterback to start a game for the program. Due to health issues, Parseghian was forced to retire from coaching after the 1974 season. Dan Devine was hired to take over as head coach upon Parseghian's departure from Notre Dame in 1975. Devine was already a highly successful coach and had led Arizona State, Missouri, and the NFL's Green Bay Packers. Devine had been a leading candidate for the head coaching job at Notre Dame in 1964, when Ara Parseghian was hired. When approached for the job following Parseghian's resignation, Devine accepted immediately, joking that it was probably the shortest job interview in history. When he arrived at Notre Dame he already had a college coaching record of 120 wins, 40 losses, and eight ties and had led his teams to victory in four bowl games. At Notre Dame he would lead the Irish to 53 wins, 16 losses, and a tie as well as three bowl victories. His lasting achievement came midway through this run, when Notre Dame won the 1977 national championship, led by junior quarterback Joe Montana. The championship season climaxed with a 38–10 win in the 1978 Cotton Bowl Classic over previously top-ranked Texas, led by Heisman Trophy winner Earl Campbell. The win vaulted the Irish from fifth to first in the polls. Earlier in the season, before the annual game against USC, played at home on October 22, Devine changed the team's jerseys from navy blue & white to kelly green & gold, later known as the "green jersey game" resulting in a 49–19 victory over the Trojans. The Irish continued to wear green for the rest of Devine's tenure at the school. Because he had the unenviable task of following a legend, Devine came under heavy scrutiny while at Notre Dame and it was felt that he was never fully embraced by the Notre Dame community, despite winning a national championship. After a 5–2 start in his first season, rumors of incompetence were circulated and that Devine would be dismissed and replaced by Don Shula or even Ara Parseghian (who went so far as to say he would not return to Notre Dame under any circumstances). Even on the day of the 1977 USC game, "Dump Devine" bumper stickers were being sold outside Notre Dame Stadium. He also had the notoriety of losing to his old program, a shocking 3–0 loss to the Tigers at South Bend in 1978. It wasn’t until after Devine had left Notre Dame that the fans begun to appreciate him. On August 15, 1980, Devine announced that he would be leaving Notre Dame at the end of season, saying he wanted to be able to spend more time with his wife. He moved back to Arizona and became a fundraiser for Arizona State University's Sun Devil Foundation. 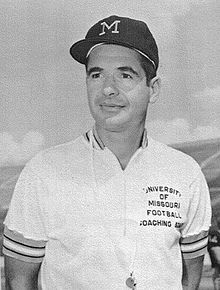 In 1985, he was elected to the College Football Hall of Fame, and then returned to his old school at Missouri seven years later as athletic director to help navigate the school through financial troubles. Devine was inducted into the inaugural class of the University of Minnesota Duluth Athletic Hall of Fame in 1991. Gerry Faust was hired to replace Devine in 1981. Prior to Notre Dame, Faust had been one of the more successful high school football coaches in the country. As coach of Moeller High School in Cincinnati he amassed a 174–17–2 record over 19 seasons. Many of his players had gone on to play for Notre Dame; indeed, when he arrived in South Bend, he was reunited with nine of his former players from Moeller. Despite his success in the high school ranks, Faust's success at Notre Dame was mixed and his record mediocre at best. In his first season, the Irish finished 5–6. In Faust's second season, Notre Dame improved slightly to 6–4–1. The most successful years under Faust were the 1983 and 1984 campaigns where the Irish finished 7–5 and made trips to the Liberty Bowl and Aloha Bowl respectively. His final record at Notre Dame was 30–26–1. To avoid being fired, Faust resigned at the end of the 1985 season, following fan cries of "Oust Faust". He announced his resignation prior to the final game of the year, where Notre Dame suffered a humiliating 58–7 loss at Miami; Allen Pinkett scored the Irish TD. Faust proceeded to take over as head coach at Akron. 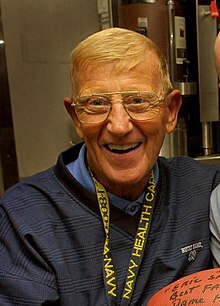 Lou Holtz had 17 years of head coaching experience by the time he was hired to lead the Irish. He had previously been head coach of William & Mary, North Carolina State, the NFL's New York Jets, Arkansas, and Minnesota. Holtz began in 1986 where his predecessor left off in 1985, finishing with an identical record of 5 wins and 6 losses. However, unlike the 1985 squad, which was generally outcoached and outplayed, Holtz's 1986 edition was competitive in nearly every game, losing five out of those six games by a combined total of 14 points. That would be his only losing season as he posted a record of 95–24–2 over the next ten seasons adding up to a 100–30–2 record overall. In 1987, Holtz led the Irish to an 8–4 record. Notre Dame's best player was star wide receiver Tim Brown, who would win the Heisman Trophy that season and is Notre Dame's seventh and last Heisman winner to date. The season began with the Irish defeating #9 Michigan in Ann Arbor, Michigan by a score of 26–7. The next week, the Irish defeated #17 Michigan State by a score of 31–8. After defeating Purdue, the Irish lost to Pittsburgh and lost starting quarterback Terry Andrysiak to injury during the game. With sophomore quarterback Tony Rice under center, the Irish reeled off five straight wins, beginning with Air Force, then USC, Navy, Boston College and #10 Alabama. Notre Dame would then lose their last three to close the season, starting with Penn State, then #2 Miami and Texas A&M in the Cotton Bowl. In contrast to Faust, Holtz was well known as a master motivator and a strict disciplinarian. The tone was set with Holtz's first meeting with his team as Irish head coach in 1986, immediately demanding his players sit up straight in their chairs and look him in the eye as he spoke. He displayed the latter trait in spades when two of his top contributing players showed up late for dinner right before the then top-ranked Irish played second-ranked USC in the final regular season game of 1988. In a controversial move, coach Lou Holtz took his 10–0 Irish squad to Los Angeles without stars Ricky Watters and Tony Brooks, who he suspended for disciplinary reasons. This was not the first time these players had gotten into trouble and the players had been warned there would be serious consequences if it happened again. His move was vindicated when the Irish defeated USC anyway. Holtz was named national coach of the year (Paul "Bear" Bryant Award) in 1988, the same season he took Notre Dame to an upset of No. 1 Miami in the Catholics vs. Convicts series and a win over No. 3 West Virginia in the Fiesta Bowl, thus capturing the national championship. The Irish finished a perfect 12–0 in 1988, its last undefeated season and national championship to date. Occasionally, despite his lack of success with the N.Y. Jets, he was rumored to be leaving Notre Dame for the NFL. Following a 6–10 season in 1990 and an 8–8 showing in 1991, the Minnesota Vikings were rumored to replace Jerry Burns with Holtz. However, Holtz denied these rumors each of those two seasons. Holtz remained at Notre Dame; the Vikings, meanwhile, hired Dennis Green to replace the retired Jerry Burns. Holtz nearly replaced Green five years later after retiring from Notre Dame. The 1988 national champion Fighting Irish visited President Ronald Reagan in the White House in January 1989. In 1989, Holtz led the Irish to a 12–1 record. The Irish began the season in the Kickoff Classic game in East Rutherford, New Jersey against Virginia. The Irish won by a score of 36–13. Next, top-ranked Notre Dame defeated #2 Michigan by a score of 24–19. That was followed by wins over Michigan State, Purdue, Stanford, #17 Air Force, #9 USC, #7 Pittsburgh, Navy, SMU and #17 Penn State. The Irish would lose to #7 Miami the following week, ending Notre Dame's 23-game winning streak. Holtz would lead the Irish to a victory in the Orange Bowl over #1 Colorado to end the season. Holtz led the Fighting Irish to a 9–3 record in 1990. The season began with a #1 ranking and a victory over #4 Michigan by a score of 28–24. The Irish defeated #24 Michigan State the following week then beat Purdue. The Irish would suffer its first defeat of the season the next week, losing to Stanford by a score of 36–31. The Irish would rebound to post five consecutive wins, defeating Air Force, #2 Miami, Pittsburgh, Navy and #9 Tennessee. After losing 24–21 to #22 Penn State, the Irish defeated USC by a score of 10–6 in the regular season finale. The Irish would get a rematch with Colorado in the Orange Bowl but would lose by a score of 10–9. The Fighting Irish would go 10–3 in 1991. After defeating Indiana to open the season, the Irish lost to #4 Michigan by a score of 24–14. The Irish won their next seven, defeating Michigan State, Purdue, Stanford, #12 Pittsburgh, Air Force, USC and Navy. The Irish would suffer a defeat to #13 Tennessee at home, blowing a 24-point lead to lose by a score of 35–34. Notre Dame would then lose back-to-back games for the first time since 1987 when they lost to unranked Penn State, their first loss to an unranked opponent also since 1987. The Irish would close out the regular season with a victory over Hawaii by a score of 48–42. The Irish would receive a berth in the Sugar Bowl in New Orleans, Louisiana, where they defeated Florida by a score of 39–28. In 1992, Notre Dame finished 10–1–1. After defeating Northwestern to start the season, the Fighting Irish tied #5 Michigan, their first tie of the Holtz era. After defeating Michigan State and Purdue, the Irish lost to #19 Stanford by a score of 33–16. Notre Dame would win out for the rest of the season, defeating Pittsburgh, BYU, Navy, #9 Boston College, #21 Penn State, #23 USC and the Cotton Bowl against #3 Texas A&M. The Irish would enjoy another successful season in 1993, finishing the season at 11–1. After scoring 27 points in wins over Northwestern and #2 Michigan to start the season, the Irish defeated Michigan State, Purdue, Pittsburgh, BYU, USC, Navy and #1 Florida State. However, a loss to #12 Boston College on a game-winning field goal as time expired by a score of 41–39 ended the Irish's national championship aspirations. The Irish would face a rematch with #6 Texas A&M in the Cotton Bowl to finish the season, a game the Irish won by a score of 24–21. In 1994, Holtz led Notre Dame to a 6–5–1 record, the Irish's worst record since Holtz's first season in 1986. The Irish would begin by defeating Northwestern but would lose to #5 Michigan by a score of 26–24. The Irish defeated Michigan State the following week by a score of 21–20. After wins over Purdue and Stanford, the Irish would lose three of their next four to drop out of the rankings for the first time since 1986. After beating Navy, the Fighting Irish lost to #6 Florida State by a score of 23–16. After beating Air Force, Notre Dame tied USC and lost to #5 Colorado in the Fiesta Bowl by a score of 41–24. The Irish would improve to 9–3 in 1995. Despite getting upset by Northwestern to begin the season, the Irish won their next three, defeating Purdue, Vanderbilt (a game in which Coach Holtz missed because of a health issue and defensive coordinator Bob Davie filled in as head coach for the game), and #10 Texas. After losing to #6 Ohio State, the Irish reeled off six straight wins, defeating #15 Washington, Army, #5 USC, Boston College, Navy and Air Force. The Irish finished the 1995 campaign by losing to #8 Florida State in the Orange Bowl. Lou Holtz's last season at Notre Dame in 1996 resulted in an 8–3 record. After defeating Vanderbilt, Purdue and #8 Texas, the Irish lost to #4 Ohio State. Notre Dame would finish the season with a win over #16 Washington, a loss to Air Force in overtime, a win over Navy, a win over Boston College, a win over Pittsburgh, a win over Rutgers and an overtime loss to USC, snapping the Irish's 13-game non-losing streak against the Trojans. Holtz's option offense, which helped catapult Notre Dame to many victories in the late 1980s and early 1990s, also helped rack up impressive recruiting classes. During the 1989 season, Holtz had the following future NFL players on offense: QB Rick Mirer, RB Ricky Watters, RB Anthony Johnson, RB Rodney Culver, RB Dorsey Levens, and WR Raghib Ismail. In 1990, he added RB Jeff Burris (who would later move to Safety), FB Jerome Bettis and TE Irv Smith. 1991 saw the additions of RB Reggie Brooks and FB Ray Zellars. 1992 saw the addition of WR Derrick Mayes. For 1993, he added FB Marc Edwards. In 1995, he added RB Autry Denson. From the 1987–1991 NFL Drafts, there were 33 Notre Dame players selected. From the 1992–1995 NFL Drafts, there were 32 Notre Dame players selected. Overall, Holtz took Notre Dame to one undefeated season, nine consecutive New Year's Day bowl games, and top 10 finishes in the AP poll in five seasons. Holtz retired from Notre Dame following the 1996 season, but would unretire in 1999 to accept the head coaching position at South Carolina where he would serve until the completion of the 2004 season. Bob Davie, who had been Holtz's defensive coordinator from 1994 to 1996, was promoted to head coach when Holtz retired. Davie, who turned down a head coaching offer from Purdue to accept the Irish's head coaching position, was a well-respected defensive mind who had also served as defensive coordinator at Tulane and Texas A&M. Davie had also filled in as head coach for one game during the 1995 season when Lou Holtz was dealing with a health issue. One of his first major decisions was to fire long-time offensive line coach Joe Moore, who then successfully sued the university for age discrimination. On Davie's watch, the team suffered three bowl game losses (1997 Independence Bowl, 1999 Gator Bowl, and 2001 Fiesta Bowl), and it failed to qualify for a bowl game in two others (1999 and 2001). The highlight of Davie's tenure was a 36–20 upset win in 1998 over #5 Michigan, the defending national champions. Davie's Irish also posted a 25–24 home victory over USC in 1999. Davie nearly defeated top ranked Nebraska in 2000, with the Irish comeback bid falling short in overtime 27–24. The aforementioned 2001 Fiesta Bowl was Notre Dame's first invitation to the Bowl Championship Series. The Irish lost by 32 points to Oregon State, but would finish No. 15 in the AP Poll, Davie's highest ranking as head coach. The 2001 squad was awarded the American Football Coaches Association Achievement Award for its 100% graduation rate. On December 17, 1999, Notre Dame was placed on probation by the NCAA for the only time in its history. The association's Committee on Infractions found two series of violations. The New York Times reported "the main one involved the actions of a booster, Kimberly Dunbar, who lavished gifts on football players with money she later pleaded guilty to embezzling." In the second series of events, a football player was accused of trying to sell several complimentary game tickets and of using others as repayment of a loan. The player was also said "to have been romantically involved with a woman (not Dunbar), a part-time tutor at the university, who wrote a term paper for another player for a small fee and provided players with meals, lodging and gifts." The Dunbar violation began while Lou Holtz was head coach: "According to the NCAA committee report, Dunbar, the woman at the center of the more serious violations, had become romantically involved with several Notre Dame football players from June 1995 to January 1998 and had a child with one, Jarvis Edison." Notre Dame was placed on probation for two years and lost one of its 85 football scholarships each year in what the Times termed "minor" penalties. Following the 1998 season, the team fell into a pattern of frustrating inconsistency and alternated between successful and mediocre seasons. Despite Davie's rocky tenure, new athletic director Kevin White gave the coach a contract extension following the Fiesta Bowl-capped 2000 season, then saw the team start 0–3 in 2001 – the first such start in school history. Disappointed by the on-field results, coupled with the Joe Moore and Kim Dunbar scandals, the administration decided to dismiss Davie after the 2001 season. His final record at Notre Dame was 35–25. After departing Notre Dame, Davie accepted an offer from ESPN to serve as a play-by-play broadcast college football analyst, a position he would hold for ten years before New Mexico hired him to be their head football coach in December 2011. On December 9, 2001, Notre Dame hired George O'Leary, the head coach at Georgia Tech, to replace Davie. However, while researching a "local boy done good" story on O'Leary, (Manchester) Union Leader reporter Jim Fennell uncovered misrepresentations in O'Leary's resume that had influenced the administration's decision to hire him. The resulting media scandal embarrassed Notre Dame officials, and tainted O'Leary; he resigned five days later, before coaching a single practice, recruiting a single player, or hiring a single assistant coach. O'Leary's tenure is the shortest of any head coach in FBS history. O'Leary would go on to become the head football coach at the University of Central Florida. Once again in need of a new head coach, the school turned to Tyrone Willingham, the head coach at Stanford. Willingham's hiring made him the first African American head coach in Notre Dame football history. Bringing a feeling of change and excitement to campus, Willingham led the 2002 squad to a 10–2 regular season record, including an 8–0 start with wins over #7 Michigan and #11 Florida State, and a No. 4 ranking. This great early start, however, would be the lone highlight of Willingham's tenure, as Notre Dame finished the year with a heart-breaking loss to Boston College, then lopsided losses to USC and North Carolina State in the Gator Bowl. The program faltered over the next two seasons under Willingham, compiling an 11–12 record. During this time, Notre Dame lost a game by at least 30 points on five occasions. Furthermore, Willingham's 2004 recruiting class was judged by analysts to be the worst at Notre Dame in more than two decades. Citing Notre Dame's third consecutive four-touchdown loss to arch-rival USC compounded by another year of sub-par recruiting efforts, the Willingham era ended on November 30, 2004 (after the conclusion of the 2004 season) when the university chose to terminate him and pay out the remainder of Willingham's six-year contract. Willingham wouldn't be unemployed for long, however, as he would accept the head coaching position at Washington two weeks after he was fired by the Irish. After Willingham's firing, Notre Dame initially pursued Utah head coach Urban Meyer, who had been an Irish assistant from 1996–2000. After Meyer accepted the Florida head coaching position and turned down the Irish, Charlie Weis left the NFL's New England Patriots, where he won three Super Bowls as offensive coordinator, to become head football coach for the Irish beginning with the 2005 season. Weis' hiring as the Irish's 30th head football coach made him the first Notre Dame graduate to hold the football head coaching position on a full-fledged basis since Joe Kuharich (a 1938 Notre Dame graduate). In his inaugural season he led Notre Dame to a record of 9–3, including an appearance in the Fiesta Bowl, where they were defeated by the Ohio State Buckeyes 34–20. In the first half of the first game (against Pittsburgh), Notre Dame had gained more offensive yards than it had in five games combined, during the previous season. On September 25, Weis and the Irish traveled to Seattle, Washington to face Washington and former head coach Tyrone Willingham, who was hired by the Huskies to be their head coach two weeks after getting fired at Notre Dame. The Irish won by a score of 36–17. Quarterback Brady Quinn would go on to break numerous team passing records that season and rise to the national spotlight, by holding 35 Notre Dame records as well as becoming a top Heisman Trophy contender. Wide receiver Jeff Samardzija would be the team's leading receiver and would go on to a successful career in Major League Baseball as a pitcher for the San Francisco Giants. Tight end Anthony Fasano would be another key offensive player during the 2005 season who would go on to an NFL career with the Dallas Cowboys, Miami Dolphins, Kansas City Chiefs and Tennessee Titans. During the 2005 season, Notre Dame signed Weis to a big raise and ten-year contract extension that was set to keep the coach in South Bend through the 2015 season. Weis and the Irish went into the 2006 season with a No. 2 preseason ranking in the ESPN/Coaches Poll. They finished the regular season with a 10–2 record, losing only to Michigan and USC. Notre Dame accepted a bid to the 2007 Sugar Bowl, losing to LSU 41–14. This marked their ninth consecutive post-season loss, the longest drought in NCAA history. As a result, Notre Dame dropped to No. 17 in the final rankings. In the wake of a graduating class that sent eleven players to the NFL, the 2007 season (3–9) included various negative milestones: the most losses in a single year (9); two of the ten worst losses ever (38–0 losses to both Michigan and USC); and the first 6-game losing streak for home games. The Naval Academy recorded their first win over the Irish since 1963, breaking the NCAA-record 43-game streak. In 2008, the Irish started 4–1, but completed the regular season with a 6–6 record, including a 24–23 home loss to Syracuse, the first time that Notre Dame had fallen to an eight-loss team. Quarterback Jimmy Clausen would be the team's star player, completing over 60% of his passes his sophomore season in 2008. Despite speculation the university might fire Weis, it was announced he would remain head coach. Weis's Notre Dame squad ended the season breaking the Irish's NCAA record nine-game bowl losing streak by beating Hawaii, 49–21, in the Hawaii Bowl. After the 2008 season, offensive coordinator Mike Haywood left to accept the head coaching position at Miami (OH). Instead of hiring a replacement, Weis elected to assume offensive coordinator duties himself, which included calling the plays. 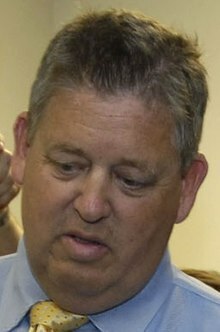 Charlie Weis entered the 2009 season with the expectation from the Notre Dame administration that his team would be in position to compete for a BCS Bowl berth. Notre Dame started the first part of the season 4–2, with close losses to Michigan and USC. Many of their wins were also close, aside from a 35–0 victory over Nevada and a 40–14 defeat of Washington State. Sitting at 6–2, however, Notre Dame lost a close game at Notre Dame Stadium to Navy, 23–21. This loss was the second to Navy in the last three years, and would be the first loss in a four-game losing streak to finish the season. The following week, Notre Dame lost to #8 Pittsburgh, then lost to UConn at home in double overtime on senior day. The Irish lost to Stanford the last week of the season by a score of 45–38. Quarterback Jimmy Clausen and wide receiver Golden Tate would forgo their senior seasons and enter the NFL Draft. Weis was fired on November 30, 2009, exactly five years after his predecessor. According to Weis' buyout, he was to be paid $6 million then $2.05 million annually until the contract ran out in December 2015 for a total of about $19 million. During that time, Weis made more money annually not to coach the Irish than his successor, Brian Kelly, made to coach the team. After leaving Notre Dame, Weis would serve as offensive coordinator for the NFL's Kansas City Chiefs in 2010 as well as Florida under Will Muschamp in 2011 before accepting the head coaching position at Kansas in December 2011. His hiring made him the fifth consecutive former Notre Dame head coach (sixth counting George O'Leary) to be hired as head coach by another FBS school; joining Gerry Faust (Akron), Lou Holtz (South Carolina), Bob Davie (New Mexico) and Tyrone Willingham (Washington). O'Leary was hired by Central Florida. Kelly and the Irish looked to improve on their 8–5 record from the prior year. However, an early season upset to a Skip Holtz-led South Florida team, and a last second loss to Michigan in Ann Arbor left the Irish at 0–2 to start the season. The Irish bounced back to beat #15 Michigan State and had two 4-game winning-streaks, with the only loss during that stretch coming at the hands of USC. The Irish also broke Navy's 2-game winning streak over Notre Dame (2009–10). Notre Dame finished the season with an 8–4 record but lost 18 – 14 to Florida State in the 2011 Champs Sports Bowl, concluding the 2011 campaign with and 8–5 record overall, identical to the 2010 season. In the team's losses, multiple turnovers from the quarterback position were often the culprit, and as a whole turnovers at critical times in the game often derailed potential Irish comebacks. After the 2011 season, offensive coordinator Charley Molnar left ND to accept the head coaching position at UMass. Safeties coach and recruiting coordinator Chuck Martin would move over to the offensive side of the ball as Molnar's replacement running the offense. On September 12, 2012, during the football program's 125th season, Notre Dame announced that it would leave the Big East Conference for the Atlantic Coast Conference (ACC), excluding the football and hockey programs. This move became official on July 1, 2013, in time for the fall sports to compete within the ACC conference. While the Fighting Irish football team will remain an FBS independent, it has agreed to play five games per season against ACC teams starting with the 2014 football season, as the schedule allows. In return, Notre Dame will become eligible to participate in the ACC's sub-BCS level bowl arrangements. On November 18, 2012, Notre Dame was ranked No. 1 in the nation in both the AP and Coaches' polls after reaching 11–0 during the regular season for the first time since 1993, also ranking No. 1 in the BCS standings for the first time in the 14-year history of the selection system. After defeating the University of Southern California Trojans on November 24, 2012, Notre Dame concluded its first 12–0 regular season, and on December 2, 2012, the Irish were formally named to appear in the BCS National Championship Game for the first time in the 2013 BCS National Championship Game. In that game, on January 7, 2013, the Irish lost to Alabama 42–14. Coming off the previous year's national title game appearance, the Fighting Irish were dealt a blow when 2012 starting quarterback, Everett Golson, was suspended from the University due to an academic violation. Senior Tommy Rees then took over. Notre Dame's 2013 season ended with a record of 9–4 and a victory over Rutgers in the Pinstripe Bowl. Notre Dame finished No. 20 in the AP poll. After the 2013 season, offensive coordinator Chuck Martin left ND to accept the head coaching position at Miami (OH), marking the second assistant coach to leave Kelly's staff to accept an FBS head coaching job. Mike Denbrock was promoted from wide receivers coach to offensive coordinator to replace Martin. The 2014 season started off with 6 straight victories and a #5 national ranking heading into a showdown with #2 Florida State in Tallahassee, Florida. FSU won that game 31–27, on a controversial offensive pass interference call that brought back a last second Notre Dame touchdown. The Fighting Irish bounced back with a win against Navy before dropping their final 4 games of the season. They did win the Music City Bowl by defeating the LSU Tigers and finished the season at an 8–5 record. After the 2014 season, the Irish again changed offensive coordinators, as Mike Denbrock stepped down from the position due to prostate cancer and returned to coaching the team's receivers. The 2015 Fighting Irish began its season with another new offensive coordinator, Mike Sanford Jr. That year's squad is arguably the most explosive offense that Brian Kelly has coached at Notre Dame. During the regular season, the Irish were one of twenty-one schools in the country to average 200 or more passing yards and rushing yards per game. The Irish had fourteen plays of over 50 yards during the season, which ranked 13th in the country and was a school record. They also had two touchdowns of over 90 yards, (a 91-yard touchdown run by C. J. Prosise and a 98-yard touchdown run by Josh Adams). The Irish only had two in the previous 126 years of Notre Dame football. The running game was dominant. The 5.76 yards per carry were fifth in the country. They finished the regular season averaging 34 points per game, including a 62-point effort against UMass, the most points in a game since 1996. The Irish finished their 2015 season with a 10–3 record, a ranking of #11 in the AP and #12 in the Coaches' Poll and a Fiesta Bowl appearance, a loss to Ohio State. The 2016 season ended with a 4–8 record, Brian Kelly's worst win/loss record at Notre Dame up to that point. The tone for the season was set early, with a heartbreaking double overtime loss to Texas in the season opener. On September 24, Notre Dame lost to Duke by a score of 38–35. Just 4 games into the season, Brian Kelly fired defensive coordinator Brian VanGorder. Mike Elko was hired from Wake Forest as VanGorder's replacement. After a sloppy 10–3 loss to NC State in Raleigh, North Carolina during messy conditions due to Hurricane Matthew, Kelly publicly called out his starting center over "poor snapping and atrocious play". At the end of the season, starting quarterback DeShone Kizer declared for the NFL Draft and backup quarterback Malik Zaire announced he would be transferring in the winter after graduation. Offensive coordinator Mike Sanford Jr. left the ND staff after the season to accept the head coaching position at Western Kentucky, making him the third Irish OC under Kelly to accept an FBS head coaching position. Chip Long was hired from Memphis as his replacement. Mike Denbrock also departed the Notre Dame staff, accepting the offensive coordinator position at Cincinnati under new head coach Luke Fickell. Amidst speculation that Kelly's job was in jeopardy and that Kelly was looking to leave Notre Dame, athletics director Jack Swarbrick announced that Kelly would return for the 2017 season. The 2017 season ended with a 10-3 record, and a win in the Citrus Bowl over LSU. On the surface, this was one of Kelly's strongest seasons at ND. An early one-point loss to #2 Georgia set the tone for the first half of the season. The tough running of running back Josh Adams behind an experienced and talented offensive line allowed Notre Dame to string together 6 consecutive 20+ point victories against solid competition like #11 USC and #14 NC State. But it all came crashing down when #3 Notre Dame visited #7 Miami in South Florida on Nov 7, 2017. An embarrassing 41-8 loss effectively ended the Irish hopes of a playoff run. They went on to struggle in final games to Navy (W 24-17) and Stanford (L 20-38). The strong start and disappointing finish made for mixed feeling among Irish fans after a horrific 2016 season. Notre Dame has won eight wire service (AP or Coaches') national championships, second most ever in the post-1936 poll era. Notre Dame claims national championships in an additional three seasons before the major poll era, for a total of 11. Notre Dame, however, is often credited with 13 consensus national championships in total. The 1938 and 1953 seasons are part of the reason for the discrepancy. In the 1938 season, 8–1 Notre Dame was awarded the national championship by the Dickinson System, while Texas Christian (which finished 11–0) was awarded the championship by the Associated Press. In the 1953 season, an undefeated Notre Dame team (9–0–1) was named national champion by every major selector except the AP and UPI (Coaches') polls, where the Irish finished second in both to 10–1 Maryland. As Notre Dame has a policy of only recognizing AP and Coaches' Poll national championships post-1936, the school does not officially recognize the 1938 and 1953 national championships. The NCAA does not list 1938 and 1953 but does recognize 1919 and 1964, making Notre Dame a national champion selection in thirteen seasons: 1919, 1924, 1929, 1930, 1943, 1946, 1947, 1949, 1964, 1966, 1973, 1977, 1988. In short, Notre Dame has 3 National Champions selected by the Coaches' Poll (1950-) and 8 selected by the AP Poll (1936-). The program claims 11 championships, the NCAA recognizes them with 13, and they've been selected National Champions 21 times by all NCAA recognized "major selectors." As of 2017, Notre Dame has the second highest winning percentage in NCAA Division I FBS (I-A) history (.729)(minimum 100+ years playing football). As of 2014, Notre Dame has produced the most players drafted into the National Football League of any program in the country. As of the 2015 NFL draft, 487 players have been drafted. As of 2017, Notre Dame is second in wins among Division I-A/FBS programs (906), trailing Michigan (943). As of 2014, Notre Dame has the fewest losses of any NCAA Division I program (304) that has been playing football for 100+ years. As of 2014, Notre Dame has 106 winning seasons in 126 years of football, and only 13 losing seasons. One of two football programs with the most individual Heisman Trophy winners at seven (shares the distinction with Oklahoma, Ohio State has seven Heisman Trophies that were won by six players). As of 2014, Notre Dame has produced more 1st Team All-Americans (188), consensus All-Americans (81 players on 99 selections) and unanimous All-Americans (33) in football than any other college program. Notre Dame is represented by 48 players and coaches in the College Football Hall of Fame, the most of any university. 12 former players are in the Pro Football Hall of Fame, tied with USC. Helped by its status as a highly regarded academic institution (ranked 19th by U.S. News & World Report), Notre Dame is second only to Nebraska in Academic All-Americans (43). Since 1962, Notre Dame has graduated 98.74% of its football players in four years. As of 2006, only 13 football players in this time have left Notre Dame without finishing their degree requirements. Also of note is the 90% graduation rate of ND's African American players (only Navy and Boston College have higher African American graduation rates). Notre Dame holds the NCAA record for Most consecutive wins over one opponent, beating the US Naval Academy (USNA) 43 times in a row before falling to them in 2007. The football program is also known for ending the Oklahoma Sooners' NCAA record winning streak of 47 games in 1957. Coincidentally, Oklahoma's 28–21 loss to Notre Dame to open the 1953 season was the last loss before the beginning of the streak. Notre Dame has had 13 undefeated seasons and 11 others with at most one loss or tie. Notre Dame is one of only three out of the current 124 Football Bowl Subdivision (formerly Division I-A) teams to have never played a Football Championship Subdivision (formerly Division I-AA) team since the divisions were created in 1978. The other two are UCLA and USC. Notre Dame is one of only two Catholic universities that field a team in the Football Bowl Subdivision, the other being Boston College. Notre Dame has played in many regular season games that have been widely regarded by both the media and sports historians as historic or famous games. Notre Dame has played in many games labeled as "game of the century" games as well as several No. 1 vs No. 2 matchups, It has also participated in several games that ended record streaks in college football. The games listed are widely regarded as of historical importance to the game of college football and are written about by sports historians and make many sportswriters' lists. Notre Dame's all-time record after September 1, 2018, stands at 907 wins, 323 losses, and 42 ties. The winning percentage of .729 is 1st All-Time. Its 907 wins are second only behind Michigan, while its 324 losses are tied with Ohio State as the second lowest of any college programs that have been playing football for 100 years or more, behind Oklahoma's 323. * George O'Leary did not coach a single practice or game, resigning five days after being hired for misrepresenting his academic credentials. † Kent Baer served as interim head coach for one game at the 2004 Insight Bowl after Tyrone Willingham was fired. Notre Dame has made 37 Bowl appearances, winning 17 and losing 19, with one game vacated. After an initial appearance in a postseason contest in the 1925 Rose Bowl, the Fighting Irish refused to participate in bowl games for more than four decades; writers like Dan Jenkins have speculated that Notre Dame might have gone to as many as twenty bowl games during the self-imposed forty-five-year hiatus. It has played in the BCS National Championship Game (1 loss), Rose Bowl (1 win), the Cotton Bowl Classic (5 wins, 2 losses), the Orange Bowl (2 wins, 3 losses), the Sugar Bowl (2 wins, 2 losses), the Gator Bowl (1 win, 2 losses), the Liberty Bowl (1 win), the Aloha Bowl (1 loss), the Fiesta Bowl (1 win, 4 losses), the Independence Bowl (1 loss), the Insight Bowl (1 loss), Hawaii Bowl (1 win), the Sun Bowl (1 win), the Pinstripe Bowl (1 win) and the Citrus Bowl (1 win). From 1994 to the 2006 football seasons, Notre Dame lost 9 consecutive bowl games, tied with Northwestern University for the most in NCAA history. That streak ended with a 49–21 win over Hawaii in the 2008 Hawaii Bowl. In the process, Notre Dame scored its highest point total in post-season play. The record of 9 consecutive bowl losses was later tied by Northwestern in 2011, then that streak was snapped a year later. Between 2009–2016, and resuming again in 2018, Notre Dame has hosted an annual off-site home football game known as the Shamrock Series. The series promotes Notre Dame's athletic and academic brand, and has brought the Fighting Irish to San Antonio, New York, Greater Washington, D.C., Chicago, Indianapolis, Boston and the Dallas/Fort Worth metroplex. Prior to the 2012 season, Notre Dame Athletic Director Jack Swarbrick announced at a news conference of plans to continue the series through 2016. He confirmed after his news conference that New York is expected to fall in that rotation and then continue to be the one consistently repeating venue for Shamrock Series games. The Shamrock Series was not held in 2017, but resumed in 2018. 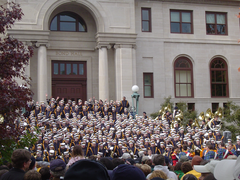 One of the unique aspects of the Shamrock Series is its inclusion of academic and other non-football activities in the area of that year's host city the days and hours leading up to the game, which include pep rallies, drummers' circles, and academic lectures. Seven Notre Dame football players have won the Heisman Trophy, more than any other university (Ohio State has 7 trophies won by 6 players; USC has 6 trophies, following Reggie Bush's forfeit of the 2005 award due to NCAA violations). Forty-five former Notre Dame players and 6 coaches have been inducted into the College Football Hall of Fame, located in Atlanta, Georgia. Notre Dame leads all universities in players inducted. Notre Dame's home jersey is navy blue with white numerals, gold outlining, and a small interlocking "ND" logo on each sleeve. The away jersey is white with navy numerals, gold outlining, and the interlocking "ND" on the sleeves. In recent years, neither jersey included the player's name on the back, but names were included during the Dan Devine and Gerry Faust eras. However, for the Irish's Hawai'i Bowl appearance in 2008 vs. the University of Hawai'i, Notre Dame once again wore last names on their jerseys. Gold pants, with a small ND logo just below the left waist, are worn with both home and away jerseys. Notre Dame's helmets are solid gold with gray facemasks, the gold being emblematic of the University's famed "Golden Dome." Notre Dame's tradition for the team's student managers to spray-paint the team's helmets prior to each game ended in 2011 when the football equipment staff, along with Notre Dame Athletics Director Jack Swarbrick and head coach Brian Kelly outsourced the painting process to Hydro Graphics Inc.
Over the years, Notre Dame has occasionally worn green instead of blue as its home jersey, sometimes adopting the jersey for an entire season – or more – at a time. Currently, Notre Dame reserves its green jerseys for "special" occasions. Often on such occasions, the Irish will take the field for warmups dressed in blue, only to switch to green when they go back to the locker room before kickoff. This tradition was started by Dan Devine in 1977 before the USC game. Notre Dame has also been known to switch jerseys at halftime, as during the 1985 USC game, and in the loss to Nile Kinnick-led Iowa in 1939, although this was to help avoid confusion between their navy uniforms and Iowa's black ones. The current design of the jersey is kelly green with gold numbers and white outlining. For the 2006 Army game, Coach Charlie Weis broke out the Green jerseys as a reward to his senior players, as well finally ending the string of losses by the Irish when wearing green. Notre Dame wore throwback green jerseys in 2007 against USC in honor of the 30th anniversary of the 1977 National Championship team. On at least one occasion (1992 Sugar Bowl) Notre Dame has worn an away variant of the jersey: a white jersey with green numbers. Champion supplied football jerseys for The University of Notre Dame for over 50 years until they switched to Adidas in 2001. On July 1, 2014, the University of Notre Dame Athletic department will begin wearing uniforms and footwear supplied by Under Armour. Former tight end Tyler Eifert. During Gerry Faust's tenure (1981–85), Notre Dame's blue jerseys switched from the traditional navy to royal blue with gold and white stripes on the sleeves. The navy blue jerseys returned in 1984. No uniform numbers have been retired by Notre Dame. Upon being issued a number, each player is given a card which lists some of the more famous players who have worn that particular number. Number 3 is perhaps the most famous number in Irish football history, having been worn by Ralph Guglielmi, George Izo, Daryle Lamonica, Coley O'Brien, Joe Montana, Michael Floyd, Rick Mirer and Ron Powlus, among others. Number 5 is also notable, as it is the only number to be worn by one of the Four Horsemen (Elmer Layden) a Heisman Trophy Winner (Paul Hornung) and a National Title winning Quarterback (Terry Hanratty). Number 7 has been worn by such Irish greats as 1964 Heisman Trophy winner John Huarte, 1970 Heisman runner-up Joe Theismann, Steve Beuerlein, Jimmy Clausen and Jarious Jackson. In 2011, both Michigan and Notre Dame wore throwback uniforms in their game against each other. For the Shamrock Series games Notre Dame and their outfitters have announced that the school will wear specially-designed helmets, jerseys, and pants. Notre Dame Stadium is the home football stadium for the University of Notre Dame Fighting Irish football team. Located on the southeast part of the university's campus in Notre Dame, Indiana and with a seating capacity of 77,622, Notre Dame Stadium is one of the most renowned venues in college football. The Sporting News ranks Notre Dame Stadium as # 2 on its list of "College Football Cathedrals". and the stadium experience evokes a more traditional feel. Notre Dame Stadium is used for football related activities and for Commencement (since 2010). Notre Dame Stadium had no permanent lighting until the expansion project in 1997. NBC paid for the lighting as they have televised all Notre Dame home football games since 1991. On April 12, 2014, it was announced during the annual Blue-Gold Spring Game that a FieldTurf synthetic surface would replace the grass field after the 2014 Commencement Weekend. In November 2014 the University of Notre Dame embarked on a $400 million stadium expansion called the Crossroads Campus Project. The project is expected to be completed by August 2017. Cartier Field was the original playing field of the Fighting Irish. In 1930, it was replaced by Notre Dame Stadium, due to the growing popularity of ND football. Notre Dame's practice facility still bears the Cartier Field name. Most ND practices take place on Cartier Field. Known by fans as "the Gug" (pronounced "goog"), the Guglielmino Athletics Complex is Notre Dame's new athletics complex. The Gug houses the football offices, auditorium, weight room, training room, equipment room, practice locker room, and various other spaces for the football team for the football team. It is also connected to the Loftus Sports Center, which is where the team held its indoor practices until the summer of 2019. The complex was underwritten by Don F. Guglielmino and his family. The First Jeweled Shillelagh, awarded to the winner of the annual USC vs. Notre Dame game. Notre Dame has rivalries with several universities. Although the Fighting Irish competes as an Independent, they play a more national schedule and have frequently scheduled opponents. USC, Michigan, Michigan State, Pitt, and Navy are among Notre Dame's oldest rivals. Navy and Notre Dame have one of the longest continuous series in college football, having played 83 games without interruption since 1927. Notre Dame had a 43-game win streak during this time frame, the longest in Division 1-A football, which ended in 2007. Navy won three of four consecutive meetings in 2007, 2009, and 2010. Notre Dame has won in 2011, 2012, 2013, 2014 and 2015. Navy won in 2016. Notre Dame won in 2017. Michigan is considered Notre Dame's first and oldest rivalry, first meeting back in 1887, although the two teams did not play each other for many years. The series has been quite frequent in the near past since the rivalry was reunited beginning in 1978. It is heightened by the two schools' competition for all-time win percentage, which Michigan leads again since 2016. The most recent meeting in 2018 was won by Notre Dame 24-17 in South Bend. Michigan leads the all-time series 24–17–1, with 6 of the Wolverine victories coming before 1900. Since the first 8 games, which were perceived as "exhibitions," Notre Dame leads the series 17-16-1. Throughout the 20th century, Notre Dame truly ascended to the top school in college football, superseding Michigan. In this time, Notre Dame has won 8 service wire poll while Michigan has only won 2. This changing of the guard has fuelled the bitterness between the two schools. The rivalry is further heightened due to the fact that in the 20th century Michigan attempted to blackball Notre Dame from competing in the sport; this has often been attributed to native racism from Michigan's head coach Fielding Yost. This exclusion from the Big Ten, however, has attributed greatly to Notre Dame's conference independence and national branding. This rivalry stopped during the 2014 season when Notre Dame shut out Michigan for the first time in the rivalry's history. Shortly before the 2012 game, the Associated Press reported that Notre Dame had exercised a three-year out clause in their series contract. This series was the first casualty of Notre Dame's future arrangement with the Atlantic Coast Conference, under which the Fighting Irish will play five games per season against ACC opponents once the school joins the ACC in all sports except for football and hockey in 2014. In 2016, Michigan announced that the rivalry will resume for two consecutive seasons, in 2018 and 2019. The Michigan State Spartans are one of Notre Dame's most important rivals with the two teams playing for the Megaphone Trophy. Notre Dame holds an all-time 48–28–1 series winning margin. The one tie was the Game of the Century, one of the greatest college football games ever played. The Spartans' 28 victories over Notre Dame are second-most of any school after USC. The Megaphone Trophy series record is 32–26–1 in favor of Notre Dame. Michigan State won the Megaphone Trophy in 2010 after beating the Irish 34–31 in East Lansing on an overtime fake field goal play known as "Little Giants". In 2011, the Irish reclaimed the trophy with a 31–13 victory in which they led all the way. The tradition of having 23.9 karat gold in the helmet paint continues, with the painting process provided by Hydro Graphics, Inc. and no longer by student managers. The gold particles that are used on the helmet were collected from the re-gilding on the Notre Dame dome in 2007. During the 2011 season, however, a new helmet paint scheme was introduced; while retaining the basic gold helmet and grey facemask look, the "new" gold is much more reflective than the "old"; there have already been several variations of this new "gold chrome" look, including "brick" and "fish-scale" texturing. Formerly, prior to the start of the game, the team attended mass in semi-formal attire at the Sacred Heart Basilica. At the conclusion of mass, fans formed a line that the team walked through from the chapel to the stadium. However, in 2011 the team changed its movements prior the game, instead taking buses back to The Gug for final meetings. In 2013, Mass was moved to Friday night; as a result, the walk now originates from the Gug. Coming out of the locker room, players slap the famous "Play Like a Champion Today" sign. Since 1960, Sergeant Tim McCarthy for the Indiana State Police has read out a driving safety announcement to the crowd during the fourth quarter. When Sergeant McCarthy begins his announcement, the crowd goes silent to hear his message, which invariably ends with a pun. Sergeant McCarthy retired from this duty in the 2015 season after 55 years of fan-favorite messages. He was honored on the field on September 26, 2015, to deliver his last in-person address, in which he repeated the same announcement he did on his first gameday. At the conclusion of every home game, the team turns to the student section to salute them by raising their helmets in the air. They do this after a win or after a loss. Then, the band plays the Alma Mater, "Notre Dame, Our Mother". Those who stay link arms and sing the lyrics. Since the NFL began drafting players in 1936, 495 Notre Dame football players have been selected by NFL teams. Additionally, Notre Dame has had 65 players selected in the first round of the NFL draft, including five overall number one picks. Of the 46 Super Bowls competed, only 14 teams have won the event without an Irish player on the roster. Looking at both participating team rosters, there have only been five Super Bowls that did not feature at least one former Notre Dame player on either team's roster – Denver vs. Atlanta, 1999; Dallas vs. Buffalo, 1994; Washington vs. Denver, 1988; Dallas vs. Denver, 1978; and Baltimore vs. Dallas, 1971. Eleven former players have won multiple Super Bowls: Mark Bavaro, Rocky Bleier, Nick Buoniconti, Eric Dorsey, Dave Duerson, David Givens, Terry Hanratty, Bob Kuechenberg, Joe Montana, Steve Sylvester and Justin Tuck. Thirteen former Notre Dame players/alumni have been inducted into the Pro Football Hall of Fame, ranking it 1st of all College Football Programs. 2016: Edward J. DeBartolo Jr. – Former San Francisco 49ers Owner, received B.A. from Notre Dame, inducted into Pro Hall of Fame in 2016 as a Contributor. *McNally graduated from St. John's (MN), but started his career at Notre Dame and is listed as a hall of famer under both schools in the Pro Football Hall of Fame. The Fighting Irish are unique among sports teams in the United States, as they are the only team, professional or college, to have all their games broadcast nationally on the radio, as well as the only team to have all of their home games broadcast nationally on television. Notre Dame famously left the College Football Association, a consortium that administered television broadcast rights on behalf of over 64 schools, in 1990, in order to establish its own broadcasting deal with NBC. From 1968 to 2007, Westwood One served as the official radio partner for the Irish, broadcasting their games for 40 consecutive years. Until the 2006 Air Force game, Notre Dame had a record 169 consecutive games broadcast nationally on either NBC, ABC, ESPN, or CBS. The 2006 ND vs. Air Force game was broadcast on CSTV, a college sports channel owned by CBS who had an exclusive contract with the Mountain West Conference, of which Air Force is a member. NBC has been televising Notre Dame Home football games since the 1991 season. Notre Dame is the only FBS football team to have all of its home games televised exclusively by one television network. In addition to TV broadcasts, NBC also maintains several dedicated websites to ND football, and Notre Dame Central, which provides complete coverage, full game replays and commentary of the Notre Dame team. NBC's television contract with Notre Dame was renewed in April 2013 and is set to continue through the 2025 football season. Radio rights to the Fighting Irish are currently held by IMG Sports, who began a 10-year deal with the team in 2008. The new deal displaced its previous broadcast partner, Westwood One, who had broadcast Notre Dame football nationally on radio for 40 consecutive years (after taking over from the Mutual Radio Network). Notre Dame ended its relationship with Westwood One at the conclusion of the 2007 football season citing financial reasons. IMG claims that the Notre Dame football broadcasts are carried by more affiliate stations than any other team (professional or collegiate, and in 'any' sport) in North America. The game broadcasts are also carried on SiriusXM's satellite radio and internet streaming services (on the Catholic Channel; two Catholic Channel hosts also produced a live broadcast from the official tailgate party prior to the 2017 USC game). Although the Notre Dame football program is not a full member of the Atlantic Coast Conference (ACC), it has an agreement to play an average of five ACC schools per season. In return Notre Dame has access to the non-College Football Playoff ACC bowl line-up. Notre Dame currently utilizes a format of six home games in South Bend, five away games, and one major metropolitan area neutral site "Shamrock Series" home game for scheduling. This includes preserving traditional yearly rivalries with USC, Stanford, and Navy, five rotating ACC opponents (two away ACC games will coincide in even years with away games at Navy and three away ACC games will coincide in odd years with home games against Navy), two home and home series (one home game and one away game), one one-time opponent home game, and the traveling "Shamrock Series" home game. The 2019 schedule was officially released on March 2, 2017. The 2020 schedule was officially released on December 7, 2017. The neutral site game at Lambeau Field has been designated the Shamrock Series game. An additional 1 non-ACC home game will be scheduled – TBA. The neutral site game at Soldier Field has been designated the Shamrock Series game, although television rights are owned and operated by the Big Ten Network. TBA: An additional 3 non-ACC home games will be scheduled. TBA: An additional 2 non-ACC home games will be scheduled. TBA: One additional non-ACC home game will be scheduled. TBA: An additional 3 non-ACC games will be scheduled (2 home and 1 away). ^ a b c "Notre Dame Stadium". Notre Dame Fighting Irish. Retrieved November 24, 2017. ^ "Notre Dame Football 2017 Media Guide" (PDF). University of Notre Dame. Retrieved October 5, 2017. ^ Notre Dame Logo Sheet (PDF). Retrieved June 22, 2016. ^ "FBS Football". NCAA.com. Retrieved November 16, 2017. ^ "National Championships by Year". NCAA Official Records, 2014. Retrieved January 21, 2014. ^ a b "2012 Notre Dame Football Media Guide" (PDF). University of Notre Dame. pp. 176–177. Retrieved August 26, 2012. ^ "Mike McGlinchey Named 101st Consensus All-American In School History". und.com. December 14, 2017. ^ "Colleges with Most Draft Picks". Drafthistory.com. Retrieved May 3, 2017. ^ a b Sandomir, Richard (August 25, 1991). "College Football – Notre Dame Scored a $38 Million Touchdown on Its TV Deal". The New York Times. Retrieved April 6, 2008. ^ "NBC and Notre Dame Extend Football Agreement Through 2010". CSTV.com. December 18, 2003. Retrieved April 6, 2008. ^ Gage, Jack (December 22, 2006). "The most valuable college football teams". Forbes. newsinfo.nd.edu. Archived from the original on August 28, 2007. Retrieved April 6, 2008. ^ "Notre Dame Football Program Ranked Most Valuable in College Football". Forbes.com. und.cstv.com. November 20, 2006. Retrieved April 6, 2008. ^ Dame, ENR // MarComm:Web // University of Notre. "First game in Notre Dame Football history // Moments // 125 Football // University of Notre Dame". 125.nd.edu. ^ Dame, ENR // MarComm:Web // University of Notre. "Notre Dame's First Win // Moments // 125 Football // University of Notre Dame". 125.nd.edu. ^ a b "Notre Dame's first team". Irishlegends.com. Retrieved November 16, 2017. ^ "Irish Coach Could Make Ugly History". Buffalonews.com. September 7, 2004. Retrieved November 16, 2017. ^ a b Steele, Michael R. (January 8, 2013). "The Notre Dame Football Encyclopedia". Skyhorse Publishing, Inc. – via Google Books. ^ "Jennings: Notre Dame-Michigan history preserves rivalry". ESPN.com. Retrieved June 18, 2016. ^ "Notre Dame Scholastic" (PDF). Archives.nd.edu. December 1908. Retrieved November 16, 2017. ^ "Notre Dame Football - History". Madeira.hccanet.org. Retrieved November 16, 2017. ^ "Jesse Harper Bio :: Notre Dame Football :: UND.COM :: The Official Site of Notre Dame Athletics". Und.com. Retrieved November 16, 2017. ^ "Jesse Harper Coaching Record". College Football at Sports-Reference.com. Retrieved November 16, 2017. ^ Dame, ENR/PAZ // University Communications: Web // University of Notre. "Echoes: Notre Dame vs. Army: The rivalry that shaped college football // News // Notre Dame Magazine // University of Notre Dame". Magazine.nd.edu. Retrieved November 16, 2017. ^ "Notre Dame - Michigan State Football Rivalry // UHND.com". Uhnd.com. August 7, 2015. Retrieved November 16, 2017. ^ "1913: The Program Changer". Und.com. Retrieved November 16, 2017. ^ a b c Dame, ENR // MarComm:Web // University of Notre. "This Day In History: The Forward Pass (1913 vs. Army) // Moments // 125 Football // University of Notre Dame". 125.nd.edu. Retrieved November 16, 2017. ^ a b c "Notre Dame vs. Army: The game that changed college football 100 years ago". Indystar.com. Retrieved November 16, 2017. ^ "Knute Rockne named Notre Dame coach..." Rarenewspapers.com. Retrieved November 16, 2017. ^ Dame, ENR // MarComm:Web // University of Notre. "This Day In History: Rockne Takes The Reins // Moments // 125 Football // University of Notre Dame". 125.nd.edu. ^ a b Scofield, Dan. "The True Story Of Knute Rockne, College Football's Most Renowned Coach". Bleacher Report. ^ a b c "Knute Rockne Coaching Record". College Football at Sports-Reference.com. Retrieved November 16, 2017. ^ a b "Numbers don't tell story of Knute Rockne". Espn.com. Retrieved November 16, 2017. ^ a b Collins, Michael. "The 1925 Rose Bowl: Notre Dame Vs. Stanford". Bleacher Report. ^ "Chalk Talk: the Notre Dame Box". Scout.com. Retrieved November 16, 2017. ^ Marder, Keith; Spellen, Mark; Donovan, Jim (September 27, 2017). "The Notre Dame Football Encyclopedia: The Ultimate Guide to America's Favorite College Team". Citadel Press – via Google Books. ^ "1918 Notre Dame Fighting Irish Schedule and Results". College Football at Sports-Reference.com. Retrieved November 16, 2017. ^ "5 Greatest Notre Dame vs. Michigan State College Football Games of All-Time". Athlonsports.com. Retrieved November 16, 2017. ^ ENR // MarComm:Web // University of Notre Dame. "This Day In History: Rockne Takes The Reins // Moments // 125 Football // University of Notre Dame". 125.nd.edu. ^ "Notre Dame Football :: UND.COM :: The Official Site of Notre Dame Athletics". Und.com. Retrieved November 16, 2017. ^ "Notre Dame Athletics Collection : 1899-2011" (XML). Archives.nd.edu. Retrieved November 16, 2017. ^ "Shaping College Football". Google.com. Retrieved November 16, 2017. ^ "Leslie's Weekly". Google.com. Retrieved November 16, 2017. ^ "Notre Dame Football Review" (PDF). ^ "1919 Notre Dame Fighting Irish Schedule and Results". College Football at Sports-Reference.com. Retrieved November 16, 2017. ^ "Notre Dame-Alabama National Titles: For The Record". Notredame.247sports.com. Retrieved November 16, 2017. ^ "College football national championship history". Ncaa.com. May 15, 2017. Retrieved November 16, 2017. ^ a b c GUSTKEY, EARL (December 14, 1999). "Gipp Still an Inspiration Long After His Death" – via LA Times. ^ a b "Notre Dame Football :: UND.COM :: The Official Site of Notre Dame Athletics". Und.com. Retrieved November 16, 2017. ^ "The History of Antibiotics". HealthyChildren.org. ^ Osacky, Michael. "What Does It Mean to 'Win One For The Gipper?'". Parade.com. Retrieved November 16, 2017. ^ Keyes, Ralph (2006). The quote verifier: who said what, where, and when. St. Martin's Press. ISBN 0-312-34004-4. ^ "Letter From The Publisher". Sports Illustrated. April 14, 1969. Archived from the original on October 26, 2012. Retrieved May 3, 2010. ^ "'Win One For The Gipper'". Sports Illustrated. September 17, 1979. Archived from the original on October 26, 2012. Retrieved May 3, 2010. ^ "Chicago Tribune - Historical Newspapers". Archives.chicagotribune.com. Retrieved November 16, 2017. ^ "Rockne, Knute – Indiana Football Hall of Fame". Indiana-football.org. Retrieved November 16, 2017. ^ Dame, ENR // MarComm:Web // University of Notre. "October 18, 1924: The Four Horsemen Arrive // Moments // 125 Football // University of Notre Dame". 125.nd.edu. ^ "Seven Mules - Forever Irish". Ndfootballhistory.com. Retrieved November 16, 2017. ^ "1924 Notre Dame Fighting Irish Schedule and Results - College Football at Sports-Reference.com". College Football at Sports-Reference.com. Retrieved November 16, 2017. ^ "Notre Dame vs. Army – A New Yorker State of Mind". Newyorkerstateofmind.com. Retrieved November 16, 2017. ^ Phinizy, Coles. "We Know of Knute, Yet Know Him Not". Si.com. Retrieved November 16, 2017. ^ a b c Robinson, Alan (September 9, 2007). "Rockne's gaffe remembered". The Daily Texan. Texas Student Media. Archived from the original on September 8, 2007. Retrieved September 6, 2007. ^ "1928 Notre Dame Football" (PDF). Archives.nd.edu. Retrieved November 16, 2017. ^ "Rockne's 'Win one for the Gipper' speech". Newsday.com. Retrieved November 16, 2017. ^ a b "The New York Times: This Day In Sports". Nytimes.com. Retrieved November 16, 2017. ^ Dame, ENR // MarComm:Web // University of Notre. "This Day In History: Win One For The Gipper // Moments // 125 Football // University of Notre Dame". 125.nd.edu. ^ a b Pennington, Bill (November 16, 2010). "Army-Notre Dame Game Stirs Yankee Stadium's Football Ghosts". Nytimes.com. Retrieved November 16, 2017. ^ "1929 Notre Dame Fighting Irish Schedule and Results". College Football at Sports-Reference.com. Retrieved November 16, 2017. ^ "1930 Notre Dame Fighting Irish Schedule and Results". College Football at Sports-Reference.com. Retrieved November 16, 2017. ^ "Notre Dame's 1929 National Championship - Notre Dame Football History". Uhnd.com. June 24, 2013. Retrieved November 16, 2017. ^ a b "Notre Dame's 1930 National Championship // Notre Dame Football History". Uhnd.com. July 3, 2013. Retrieved November 16, 2017. ^ "1929 Notre Dame Football" (PDF). Archives.nd.edu. Retrieved November 16, 2017. ^ "1930 College Football National Championship". Tiptop25.com. Retrieved November 16, 2017. ^ "Reading Eagle - Google News Archive Search". News.google.com. Retrieved November 16, 2017. ^ "Notre Dame vs. New York Giants 1930 Game Program". Mmqb.si.com. Retrieved November 16, 2017. ^ King, Gilbert. "The Game that Put the NFL's Reputation on the Line". Smithsonianmag.com. Retrieved November 16, 2017. ^ "Rockne's Last Game". Retrieved May 24, 2008. ^ "Knute Rocke Dies with Seven Others in Mail Plane Dive". Nytimes.com. Retrieved November 16, 2017. ^ "Movie Review: The Screen – Close-Ups of Gridiron Stars". Nytimes.com. Retrieved November 16, 2017. ^ "The Spirit of Notre Dame (1931) - Overview - TCM.com". Turner Classic Movies. ^ "Knute Rockne Memorial". College Football News. Archived from the original on January 12, 2013. Retrieved May 24, 2008. ^ "Knute Rockne born - Mar 04, 1888". History.com. Retrieved November 16, 2017. ^ a b "UND.COM :: The Official Site of Notre Dame Athletics". Und.com. Retrieved November 16, 2017. ^ Carter, Bill (November 23, 2012). "For a Notre Dame Family, a Legacy of Optimism (With an Asterisk or Two)". The New York Times. Retrieved November 23, 2012. ^ "Hunk Anderson Coaching Record". College Football at Sports-Reference.com. Retrieved November 16, 2017. ^ "TheWolfpacker.com - NC State football has past ties with Notre Dame". Ncstate.rivals.com. October 4, 2016. Retrieved November 16, 2017. ^ "1931 Notre Dame Fighting Irish Schedule and Results". College Football at Sports-Reference.com. Retrieved November 16, 2017. ^ "1931 Notre Dame Football" (PDF). Archives.nd.edu. Retrieved November 16, 2017. ^ "The history of Nebraska vs. Northwestern on the football field". Northbynorthwestern.com. Retrieved November 16, 2017. ^ Steele, Michael R. (September 1, 2012). "The Notre Dame Football Encyclopedia". Skyhorse Publishing Inc. – via Google Books. ^ "The Notre Dame Scholastic" (PDF). Archives.nd.edu. October 1931. Retrieved November 16, 2017. ^ "Notre Dame vs. Navy :: The Rivalry". Und.com. Retrieved November 16, 2017. ^ "USC ends Notre Dame winning streak - Nov 21, 1931". History.com. Retrieved November 16, 2017. ^ Dame, ENR/PAZ // University Communications: Web // University of Notre. "Echoes: Notre Dame vs. Army: The rivalry that shaped college football // News // Notre Dame Magazine // University of Notre Dame". Magazine.nd.edu. ^ "1932 Notre Dame Fighting Irish Schedule and Results". College Football at Sports-Reference.com. Retrieved November 16, 2017. ^ King, C. Richard (September 27, 2017). "Native Athletes in Sport & Society: A Reader". U of Nebraska Press – via Google Books. ^ "Chicago Tribune - Historical Newspapers". Archives.buffalotribune.com. Retrieved November 16, 2017. ^ "A True `Game Of The Century'". Und.com. Retrieved November 16, 2017. ^ Lechman, Don (October 30, 2012). "Notre Dame vs. USC: The Rivalry". Arcadia Publishing – via Google Books. ^ "1933 Notre Dame Fighting Irish Schedule and Results". College Football at Sports-Reference.com. Retrieved November 16, 2017. ^ "University of Kansas Athletics". University of Kansas. ^ a b c d "Notre Dame Football :: UND.COM :: The Official Site of Notre Dame Athletics". Und.com. Retrieved November 16, 2017. ^ "Upset special: With Rockne gone, Irish took a Michigan-like tumble". Usatoday30.usatoday.com. Retrieved November 16, 2017. ^ "Notre Dame – Purdue Football Rivalry History // UHND.com". August 14, 2015. ^ "The Notre Dame Scholastic : Volume 67" (PDF). Archives.nd.edu. Retrieved November 16, 2017. ^ a b c "Elmer Layden Bio :: Notre Dame Football :: UND.COM :: The Official Site of Notre Dame Athletics". ^ a b c d "Elmer Layden Dead". Nytimes.com. July 1, 1973. Retrieved November 16, 2017. ^ "Elmer Layden Coaching Record". College Football at Sports-Reference.com. Retrieved November 16, 2017. ^ a b "The Ohio State-Notre Dame series is nothing if not unique - FOX Sports". January 1, 2016. ^ Dame, ENR // MarComm:Web // University of Notre. "Notre Dame's First "Game of the Century," 1935 // Moments // 125 Football // University of Notre Dame". 125.nd.edu. ^ "1938 Notre Dame Fighting Irish Schedule and Results". College Football at Sports-Reference.com. Retrieved November 16, 2017. ^ "Notre Dame vs. USC :: The Rivalry". Und.com. Retrieved November 16, 2017. ^ "College Football Poll.com". Collegefootballpoll.com. Archived from the original on July 8, 2011. Retrieved November 16, 2017. ^ "Notre Dame Football :: Depth Chart :: SCW". Stevencwelsh.com. Retrieved November 16, 2017. ^ Dame, ENR/PAZ // University Communications: Web // University of Notre. "Domers in the news // News // Notre Dame Magazine // University of Notre Dame". magazine.nd.edu. ^ Kryk, John (August 20, 2007). "Natural Enemies: Major College Football's Oldest, Fiercest Rivalry-Michigan vs. Notre Dame". Taylor Trade Publishing – via Google Books. ^ "Notre Dame vs. Michigan - Notre Dame Archives News & Notes". Archives.nd.edu. Retrieved November 16, 2017. ^ a b c d Greer, Joel. "Michigan vs. Notre Dame Gridiron Feud Dates Back to 1909". ^ "The Greatest Irish Football Wins: 1941-1963". ^ "Notre Dame Vs. Michigan Postgame Notes". ^ Collins, Michael. "The Notre Dame-Michigan Rivalry: "To Hell with Notre Dame"". ^ a b c "Frank Leahy Bio :: Notre Dame Football :: UND.COM :: The Official Site of Notre Dame Athletics". ^ "Frank Leahy: A Coach For Two Schools". ^ "Page Not Found - Custom 404 - Official Site of the Allstate Sugar Bowl". Allstatesugarbowl.org. Retrieved November 16, 2017. ^ "1941 Sugar Bowl Tennessee vs Boston College". August 1, 2014. ^ a b c d "Frank "The Master" Leahy". College Football Hall of Fame. Football Foundation. Retrieved April 27, 2008. ^ a b "Frank Leahy Coaching Record". College Football at Sports-Reference.com. Retrieved November 16, 2017. ^ a b "Historical Debate: The '53 Fainting Irish". ^ "Heisman Trophy". Heisman.com. Retrieved November 16, 2017. ^ "Hawkeye Flashback: 1953 Notre Dame". January 4, 2013. ^ Dame, ENR // MarComm:Web // University of Notre. "Frank Leahy Joins The Navy // Moments // 125 Football // University of Notre Dame". 125.nd.edu. ^ "Ed McKeever Bio :: Notre Dame Football :: UND.COM :: The Official Site of Notre Dame Athletics". ^ "1944 Notre Dame Fighting Irish Schedule and Results". College Football at Sports-Reference.com. Retrieved November 16, 2017. ^ "The Cornell Daily Sun 19 September 1950 — The Cornell Daily Sun". cdsun.library.cornell.edu. ^ "1945 Notre Dame Fighting Irish Schedule and Results". College Football at Sports-Reference.com. Retrieved November 16, 2017. ^ Holland, Gerald. "Subject: Frank Leahy". ^ Carew, Wally (September 1, 2012). "A Farewell to Glory: The Rise and Fall of an Epic Football Rivalry Boston College Vs. Holy Cross". Xlibris Corporation – via Google Books. ^ "BlueAndGold.com - Notre Dame & Father Hesburgh: A Centennial Remembered". May 25, 2017. ^ Dame, ENR/PAZ // University Communications: Web // University of Notre. "Notre Dame Football: The Indisputable Importance of Saturday // News // Notre Dame Magazine // University of Notre Dame". magazine.nd.edu. ^ a b c "Terry Brennan Bio :: Notre Dame Football :: UND.COM :: The Official Site of Notre Dame Athletics". ^ "Terry Brennan named Norte Dame coach..." Rarenewspapers.com. Retrieved November 16, 2017. ^ "Terry Brennan Coaching Record". College Football at Sports-Reference.com. Retrieved November 16, 2017. ^ "Notre Dame Football Archives :: Notre Dame Football :: UND.COM :: The Official Site of Notre Dame Athletics". Und.com. Retrieved November 16, 2017. ^ Dame, ENR // MarComm:Web // University of Notre. "Notre Dame's Fifth Heisman Trophy: Paul Hornung (1956) // Moments // 125 Football // University of Notre Dame". 125.nd.edu. ^ a b "Heisman Trophy". Heisman.com. Retrieved November 16, 2017. ^ "1957 Notre Dame Fighting Irish Schedule and Results". College Football at Sports-Reference.com. Retrieved November 16, 2017. ^ "Reliving the end of OU's 47-game win streak". ^ "1958 Notre Dame Fighting Irish Schedule and Results". College Football at Sports-Reference.com. Retrieved November 16, 2017. ^ Boyles, Bob; Guido, Paul (September 27, 2017). "The USA Today College Football Encyclopedia". Skyhorse Publishing Inc. – via Google Books. ^ "Joe Kuharich Bio :: Notre Dame Football :: UND.COM :: The Official Site of Notre Dame Athletics". ^ "1956 Notre Dame Fighting Irish Stats". College Football at Sports-Reference.com. Retrieved November 16, 2017. ^ a b c Rogers, Thomas (September 27, 1981). "Joe Kuharich Dies; Coached Eagles, Irish". Nytimes.com. Retrieved November 16, 2017. ^ "Joe Kuharich Coaching Record". College Football at Sports-Reference.com. Retrieved November 16, 2017. ^ "1960 Notre Dame Fighting Irish Schedule and Results". College Football at Sports-Reference.com. Retrieved November 16, 2017. ^ a b c "Chicago Tribune - Historical Newspapers". ^ "The enigma of the interim coach". ^ "Magical 1964 Season Marked Debut Of The Era Of Ara". ^ a b c d e "Chicago Tribune - Historical Newspapers". ^ "Notre Dame vs. Syracuse, 11/18/1961 - Notre Dame Archives News & Notes". Archives.nd.edu. Retrieved November 16, 2017. ^ "Ara Parseghian remains a Notre Dame institution". September 26, 2013. ^ a b "Ara Parseghian Coaching Record". College Football at Sports-Reference.com. Retrieved November 16, 2017. ^ "1964 Notre Dame Fighting Irish Schedule and Results". College Football at Sports-Reference.com. Retrieved November 16, 2017. ^ "College Football: Ara the Beautiful". Content.time.com. November 20, 1964. Retrieved November 16, 2017. ^ "Ara Parseghian to Receive Contributions to College Football Award". Und.com. Retrieved November 16, 2017. ^ "Ara Parseghian". College Football Hall of Fame. Football Foundation. Retrieved November 16, 2017. ^ "Ara Parseghian to receive award". Espn.com. Retrieved November 16, 2017. ^ "Changing Course". Und.com. Retrieved November 16, 2017. ^ a b "5 Greatest Notre Dame vs. Texas College Football Games of All-Time". Athlonsports.com. Retrieved November 16, 2017. ^ "1970 Notre Dame Fighting Irish Schedule and Results". College Football at Sports-Reference.com. Retrieved November 16, 2017. ^ "1966 Notre Dame Fighting Irish Schedule and Results". College Football at Sports-Reference.com. Retrieved November 16, 2017. ^ "1973 Notre Dame Fighting Irish Schedule and Results". College Football at Sports-Reference.com. Retrieved November 16, 2017. ^ "Remembering Cliff Brown". Espn.com. Retrieved November 16, 2017. ^ a b "Dan Devine Dies At Age 77". Und.com. Retrieved November 16, 2017. ^ Pomarico, Frank; Serafin, Raymond (September 15, 2015). "Ara's Knights: Ara Parseghian and the Golden Era of Notre Dame Football". Triumph Books – via Google Books. ^ Russell, Marvin A. (September 27, 2017). "Linebacker in the Boardroom: Lessons in Life and Leadership". Marvin A. Russell – via Google Books. ^ a b "Dan Devine Coaching Record". College Football at Sports-Reference.com. Retrieved November 16, 2017. ^ "ESPN Classic - Devine led Notre Dame to national title". Espn.com. Retrieved November 16, 2017. ^ "1978 Cotton Bowl: Notre Dame 38 - Texas 10" (PDF). Grfx.cstv.com. Retrieved November 16, 2017. ^ a b "The Lore Of The Green Jersey". Und.com. Retrieved November 16, 2017. ^ a b Dame, ENR // MarComm:Web // University of Notre. "The Block // Moments // 125 Football // University of Notre Dame". 125.nd.edu. ^ a b Jr, Gordon S. White (September 16, 1979). "Notre Dame Wins by 12‐10; Blocks Late Michigan Kick". Nytimes.com. Retrieved November 16, 2017. ^ "Nd-michigan: `A Special One". Articles.chicagotribune.com. Retrieved November 16, 2017. ^ a b c d Kupper, Mike (May 10, 2002). "Dan Devine, 77; Hall of Fame Football Coach" – via LA Times. ^ a b Feinstein, John (November 12, 1980). "Dan Devine &". Washingtonpost.com. Retrieved November 16, 2017. ^ "1978 Missouri vs Notre Dame". Saturdaydownsouth.com. June 13, 2014. Retrieved November 16, 2017. ^ "September 9, 1978: Mizzou 3, Notre Dame 0". Rockmnation.com. May 5, 2009. Retrieved November 16, 2017. ^ "University of Minnesota Duluth - UMD Athletic Hall of Fame". Umdbulldogs.com. Retrieved November 16, 2017. ^ Crowe, Jerry (November 24, 2008). "For him, the Notre Dame job was a Faustian bargain" – via LA Times. ^ a b Jacon-Duffy, Marais (December 1, 2016). "From the Vault: 'The Bold Experiment' with Gerry Faust, Notre Dame and Moeller High School". Wcpo.com. Retrieved November 16, 2017. ^ "1981 Notre Dame Fighting Irish Schedule and Results". College Football at Sports-Reference.com. Retrieved November 16, 2017. ^ "1982 Notre Dame Fighting Irish Schedule and Results". College Football at Sports-Reference.com. Retrieved November 16, 2017. ^ "1983 Notre Dame Fighting Irish Schedule and Results". College Football at Sports-Reference.com. Retrieved November 16, 2017. ^ "1984 Notre Dame Fighting Irish Schedule and Results". College Football at Sports-Reference.com. Retrieved November 16, 2017. ^ "Gerry Faust Coaching Record". Sports-reference.com. January 1, 1970. Retrieved May 28, 2017. ^ Hersch, Hank. "Faust: From the Gipper to the Zippers". Si.com. Retrieved November 16, 2017. ^ "Even At Akron, Faust Is Faust". Articles.chicagotribune.com. Retrieved November 16, 2017. ^ Alfano, Peter (April 4, 1986). "Gerry Faust Starts Over With Akron". NYTimes.com. Retrieved May 28, 2017. ^ a b c "Lou Holtz Bio :: Notre Dame Football". Und.Com. Retrieved May 28, 2017. ^ "1986 Notre Dame Fighting Irish Schedule and Results | College Football at". Sports-reference.com. January 1, 1970. Retrieved May 28, 2017. ^ a b "2012 Notre Dame Football Media Guide" (PDF). University of Notre Dame. Retrieved August 26, 2012. ^ "Lou Holtz Coaching Record | College Football at". Sports-reference.com. January 1, 1970. Retrieved May 28, 2017. ^ "1987 Notre Dame Fighting Irish Schedule and Results | College Football at". Sports-reference.com. January 1, 1970. Retrieved May 28, 2017. ^ "Tim Brown Bio :: Notre Dame Football". Und.Com. Retrieved May 28, 2017. ^ "Heisman Trophy". Heisman.com. Retrieved May 28, 2017. ^ "Michigan Upset By Notre Dame". NYTimes.com. September 13, 1987. Retrieved May 28, 2017. ^ "College Football – Brown Runs 71 and 66 For Irish". NYTimes.com. September 20, 1987. Retrieved May 28, 2017. ^ . (September 25, 1987). "Irish Can`t Look Back Vs. Purdue". Articles.chicagotribune.com. Retrieved May 28, 2017. ^ "Irish Stunned By Pitt, Lose Andrysiak e". Articles.chicagotribune.com. October 11, 1987. Retrieved May 28, 2017. ^ "College Football: Notre Dame's Ground Attack Brings Down Air Force, 35–14". Articles.latimes.com. October 18, 1987. Retrieved May 28, 2017. ^ "Notre Dame Football". Und.Com. September 18, 2015. Retrieved May 28, 2017. ^ "Notre Dame-Boston College: Gridiron Intensity :: Notre Dame Football". Und.Com. Retrieved May 28, 2017. ^ "1987 Alabama vs Notre Dame". Saturdaydownsouth.com. Retrieved May 28, 2017. ^ AP (November 22, 1987). "College Football – Penn State Stops Notre Dame, 21–20". NYTimes.com. Retrieved May 28, 2017. ^ "Miami Is Too Much for Irish : Hurricanes Put the Big Hit on Brown & Co., 24–0 – latimes". Articles.latimes.com. November 29, 1987. Retrieved May 28, 2017. ^ Gerald Eskenazi (January 2, 1988). "Cotton Bowl – Aggies Top Irish By 35–10". NYTimes.com. Retrieved May 28, 2017. ^ "Follansbee honors legendary coach Lou Holtz | News, Sports, Jobs – The Times Leader". Timesleaderonline.com. Retrieved May 28, 2017. ^ Pam Prevatte. "Woodruff native says ex-Notre Dame coach could turn it all around – News – GoUpstate – Spartanburg, SC". GoUpstate.com. Retrieved May 28, 2017. ^ John Heisler; Tim Prister. Always Fighting Irish: Players, Coaches, and Fans Share Their Passion for ... Books.google.com. p. 314. Retrieved May 28, 2017. ^ "Bowl Championship Series – Flashback: Notre Dame-USC 1988". Espn.com. December 13, 2002. Retrieved May 28, 2017. ^ a b Anderson, Dave (November 27, 1988). "Sports of the Times – Lou Holtz of Notre Dame Raps the Gavel Again". The New York Times. Retrieved April 25, 2008. ^ "Tardy Irish Learn: Don`t Tick Off Holtz". ^ "Why 'Catholics vs. Convicts' Miami Hurricanes Notre Dame Fighting Irish is such a memorable game". Espn.com. December 10, 2016. Retrieved May 28, 2017. ^ "Fiesta Bowl: Notre Dame 34, West Virginia 21 : Dream is Shattered : Lackluster Play, Harris' Injury Keep Mountaineers From Realizing Their Goal". Articles.latimes.com. October 18, 2003. Retrieved May 28, 2017. ^ "1988 Notre Dame Fighting Irish Schedule and Results | College Football at". Sports-reference.com. January 1, 1970. Retrieved May 28, 2017. ^ Chambers, Randy (December 12, 2012). "Notre Dame Football: Comparing 1988 Championship Team to Brian Kelly's 2012 Unit". Bleacher Report. Retrieved November 16, 2017. ^ "Holtz Says Notre Dame as Worthy of No. 1 as Any If it Tops Colorado". Deseret News. December 1, 1990. Retrieved May 28, 2017. ^ "Vikings` Official Wants Holtz – tribunedigital-chicagotribune". Articles.chicagotribune.com. November 20, 1991. Retrieved May 28, 2017. ^ "Lou Holtz – The Enquirer – November 19, 1996". The Cincinnati Enquirer. November 19, 1996. Retrieved May 28, 2017. ^ Gerald Eskenazi (November 24, 1996). "'New York Jets Go Rolling Along'". Nytimes.com. Retrieved May 28, 2017. ^ "1989 Notre Dame Fighting Irish Schedule and Results | College Football at". Sports-reference.com. January 1, 1970. Retrieved May 28, 2017. ^ "Irish vs. Virginia In Kickoff Classic". NYTimes.com. January 18, 1989. Retrieved May 28, 2017. ^ Moran, Malcolm (September 14, 1989). "Holtz, With No. 1 Team, Worries About No. 2". NYTimes.com. Retrieved May 28, 2017. ^ Malcolm Moran (September 17, 1989). "College Football – Ismail Leads Notre Dame Past Michigan". NYTimes.com. Retrieved May 28, 2017. ^ "Notre Dame – Michigan State Football Rivalry". Uhnd.com. August 7, 2015. Retrieved May 28, 2017. ^ "Notre Dame – Purdue Football Rivalry History". Uhnd.com. August 14, 2015. Retrieved May 28, 2017. ^ Joseph Tybor (October 8, 1989). "Notre Dame 27, Stanford 17". Chicago Tribune. Retrieved May 28, 2017. ^ "No. 1 Notre Dame Uses Rocket to Blast Air Force Out of Path". LA Times. October 15, 1989. Retrieved May 28, 2017. ^ "USC vs ND memories: 1989 – USC Trojans". ESPN. October 19, 2011. Retrieved May 28, 2017. ^ "Laurel Leader Call Newspaper Archives, Oct 30, 1989, p. 10&#124". Newspaperarchive.com. Retrieved May 28, 2017. ^ "Notre Dame Football :: UND.COM :: The Official Site of Notre Dame Athletics". Und.Com. September 18, 2015. Retrieved May 28, 2017. ^ "Irish Show Mercy in 59–6 Win – latimes". Articles.latimes.com. November 12, 1989. Retrieved May 28, 2017. ^ "Irish Beat Penn State, 34–23, to Run Winning Streak to 23 : Notre Dame: Blair Thomas' 133 yards and two touchdowns aren't enough as the Nittany Lion defense gives up 425 yards on the ground". Articles.latimes.com. November 19, 1989. Retrieved May 28, 2017. ^ "Miami Exacts Its Revenge, 27–10 : Hurricanes: Seventh-ranked squad ends Notre Dame's winning streak and reign as top-ranked team". Articles.latimes.com. November 26, 1989. Retrieved May 28, 2017. ^ "1990s – History | Orange Bowl". Game.orangebowl.org. Retrieved May 28, 2017. ^ "1990 Notre Dame Fighting Irish Schedule and Results | College Football at". Sports-reference.com. January 1, 1970. Retrieved May 28, 2017. ^ "ESPN Classic – Classic Michigan vs. Notre Dame". Espn.com. November 19, 2003. Retrieved May 28, 2017. ^ Lou Somogyi. "BlueAndGold.com – Notre Dame-Michigan State: Top Five Moments For Fighting Irish". Notredame.rivals.com. Retrieved May 28, 2017. ^ Michael Wilbon (October 7, 1990). "Irish Run Out of Miracles: College football: Stanford upsets No. 1 Notre Dame, 36–31, when last pass is dropped in end zone. Vardell scores four touchdowns". Articles.latimes.com. Retrieved May 28, 2017. ^ "Air Force Football Travels To Notre Dame – Air Force Academy Athletics Official Athletic Site Air Force Academy Athletics Official Athletic Site – Football". Goairforcefalcons.com. Retrieved May 28, 2017. ^ Matt Smith (October 2, 2012). "Notre Dame vs. Miami: A Retrospective of the Storied Rivalry". Bleacher Report. Retrieved May 28, 2017. ^ "Norman Bone Football Program Index". Archives.nd.edu. Retrieved May 28, 2017. ^ "The Notre Dame Navy Football Rivalry". Uhnd.com. October 6, 2015. Retrieved May 28, 2017. ^ "1990 Notre Dame vs Tennessee". Saturdaydownsouth.com. Retrieved May 28, 2017. ^ "Irish in the Right Places at the Right Times, 34–29 : Notre Dame: Seniors step forward in beating Tennessee. Smith's interception near goal line thwarts comeback". Articles.latimes.com. February 1, 1994. Retrieved May 28, 2017. ^ Malcolm Moran (November 18, 1990). "College Football – Penn St. Shocks Notre Dame". NYTimes.com. Retrieved May 28, 2017. ^ "A Traditional Defeat for USC : Trojans: Notre Dame defense sparks eighth consecutive victory in series, 10–6". Articles.latimes.com. November 25, 1990. Retrieved May 28, 2017. ^ Malcolm Moran (January 2, 1991). "Top-Ranked Colorado Holds Off Notre Dame". NYTimes.com. Retrieved May 28, 2017. ^ "1991 Notre Dame Fighting Irish Schedule and Results". Sports-reference.com. January 1, 1970. Retrieved May 28, 2017. ^ Joe Boozell (July 7, 2016). "Notre Dame-Michigan: Top five games of one of college football's most historic rivalries". NCAA.com. Retrieved May 28, 2017. ^ "College Football – Midwest – Notre Dame Nets 650 Yards". NYTimes.com. September 22, 1991. Retrieved May 28, 2017. ^ "Football Game Notes – vs. Northern Illinois – Purdue University Official Athletic Site". Purduesports.Com. September 19, 2009. Retrieved May 28, 2017. ^ "USC Will Try to Extend Dominance of Stanford". Articles.latimes.com. October 19, 1991. Retrieved May 28, 2017. ^ "Pittsburgh Post-Gazette from Pittsburgh, Pennsylvania on October 14, 1991 · Page 31". Newspapers.com. October 14, 1991. Retrieved May 28, 2017. ^ "Bettis Leads the Irish Over Air Force, 28–15". Articles.latimes.com. May 9, 2009. Retrieved May 28, 2017. ^ "A Case of the Bends : Lou Holtz Loved Notre Dame's Stage, but Roller Coaster Season May Have Been Too Much for Him – Page 2". Articles.latimes.com. November 29, 1996. Retrieved May 28, 2017. ^ "Mirer, Notre Dame pass Navy in icy, 38–0 breeze Chaump cuts off run". Articles.baltimoresun.com. November 3, 1991. Retrieved May 28, 2017. ^ Moran, Malcolm (November 10, 1991). "College Football – Tennessee Rallies To Stun The Irish". NYTimes.com. Retrieved May 28, 2017. ^ Joseph Tybor (November 17, 1991). "Penn State Pummels Notre Dame". Articles.chicagotribune.com. Retrieved May 28, 2017. ^ "Notre Dame Holds Off Hawaii, 48–42". Articles.latimes.com. December 1, 1991. Retrieved May 28, 2017. ^ "1992 Game Recap / Allstate Sugar Bowl". Allstatesugarbowl.org. Retrieved November 16, 2017. ^ "1992 Notre Dame Fighting Irish Schedule and Results". Sports-reference.com. January 1, 1970. Retrieved May 28, 2017. ^ "Notre Dame Rockets Past Northwestern : Notre Dame: Miller, expected to fill role of Ismail, scores on 70-yard pass play in 42–7 victory". Articles.latimes.com. September 6, 1992. Retrieved May 28, 2017. ^ Moran, Malcolm (September 13, 1992). "College Football – Notre Dame and Michigan Sputter at the End to a 17–17 Tie". NYTimes.com. Retrieved May 28, 2017. ^ "Notre Dame 52, Michigan St. 31 – UPI Archives". Upi.com. September 19, 1992. Retrieved May 28, 2017. ^ "Notre Dame 48, Purdue 0 – UPI Archives". Upi.com. September 26, 1992. Retrieved May 28, 2017. ^ Bill Dwyre (October 4, 1992). "Stanford Overcomes Irish, 33–16". Articles.latimes.com. Retrieved May 28, 2017. ^ Call, Jeff (June 26, 2012). "BYU football: Cougars do have some game history with Notre Dame". Deseret News. Retrieved May 28, 2017. ^ "Notre Dame vs. Navy :: The Rivalry". Und.com. Retrieved May 28, 2017. ^ Joseph Tybor (November 8, 1992). "Notre Dame Bashes Bc In 54–7 Rout". Articles.chicagotribune.com. Retrieved May 28, 2017. ^ Moran, Malcolm (November 15, 1992). "Football – Irish Catch Penn State at End of Series". NYTimes.com. Retrieved May 28, 2017. ^ Moss, Tony (September 3, 2014). "Countdown to Notre Dame at USC: A Week 2 referendum". CBSSports.com. Retrieved May 28, 2017. ^ John Heisler; Tim Prister (January 1, 1992). Always Fighting Irish: Players, Coaches, and Fans Share Their Passion for ... Books.google.com. p. 169. Retrieved May 28, 2017. ^ "1993 Notre Dame Fighting Irish Schedule and Results". College Football at Sports-Reference.com. Retrieved November 16, 2017. ^ "Notre Dame Receives Wakeup Call". Articles.chicagotribune.com. Retrieved November 16, 2017. ^ "Notre Dame Throws The Book At Michigan". The New York Times. September 12, 1993. ^ "No. 3 Notre Dame 36, Michigan St. 14". Upi.com. Retrieved November 16, 2017. ^ "The Stanford Daily 1 October 1993 — The Stanford Daily". Stanforddailyarchive.com. Retrieved November 16, 2017. ^ Call, Jeff (June 26, 2012). "BYU football: Cougars do have some game history with Notre Dame". Deseretnews.com. Retrieved November 16, 2017. ^ "Irish Steamroll Past U.S.C." The New York Times. October 24, 1993. ^ "The Irish Make Up For Earlier Lapses". The New York Times. October 31, 1993. ^ Dwyre, Bill (October 17, 2014). "Notre Dame versus Florida State was an even bigger game in 1993" – via LA Times. ^ "Boston College Knocks the Smile Off the Irish". The New York Times. November 21, 1993. ^ Harvey, Randy (January 2, 1994). "Notre Dame Rallies for Victory, Then Awaits Its Fate in the Polls : Cotton Bowl: Holtz says Irish have rightful claim to the national title after they beat Texas A&M, 24–21, on a field goal by Pendergast with 2:17 to play" – via LA Times. ^ "1994 Notre Dame Fighting Irish Schedule and Results". College Football at Sports-Reference.com. Retrieved November 16, 2017. ^ Press, From Associated (September 4, 1994). "Powlus Leads Irish Past Northwestern : Notre Dame: The sophomore passes for 291 yards and four scores in 42-15 victory" – via LA Times. ^ Wojciechowski, Gene (September 11, 1994). "Irish Get the Boot Yet Again: College football: Once-dismal Michigan kicker Remy Hamilton does the job this time in 26-24 victory" – via LA Times. ^ "College Football – Notre Dame Wins Game For Powlus To Forget". Nytimes.com. September 18, 1994. Retrieved November 16, 2017. ^ "Notre Dame's Other Backs Run All Over Purdue". Articles.chicagotribune.com. Retrieved November 16, 2017. ^ "Notre Dame 34, Stanford 15". Upi.com. Retrieved November 16, 2017. ^ "Notre Dame-Navy: 10 To 1". Notredame.247sports.com. Retrieved November 16, 2017. ^ "Irish And Seminoles To Square Off On Saturday". Und.com. Retrieved November 16, 2017. ^ "Reliable Mayes Has Record Day As Notre Dame Flies Past Air Force". Articles.chicagotribune.com. Retrieved November 16, 2017. ^ "Usc Tie Jumbles Nd Bowl Plans". Articles.chicagotribune.com. Retrieved November 16, 2017. ^ "Bowl Championship Series - 1995 - Colorado 41, Notre Dame 24". Espn.com. Retrieved November 16, 2017. ^ "1995 Notre Dame Fighting Irish Schedule and Results". College Football at Sports-Reference.com. Retrieved November 16, 2017. ^ Brown, Clifton (September 3, 1995). "College Football – South Bend Shocker: Notre Dame Goes South". Nytimes.com. Retrieved November 16, 2017. ^ "1995 Big Ten results". Usatoday30.usatoday.com. Retrieved November 16, 2017. ^ a b "College Football: Notre Dame Doesn't Miss Holtz : Nonconference: With coach watching at home, the Irish rout Vanderbilt, 41-0, behind Kinder". LA Times. Associated Press. September 17, 1995. ^ "1995 Vanderbilt vs Notre Dame". June 9, 2014. ^ "Notre Dame - Texas Football Rivalry History // UHND.com". Uhnd.com. August 30, 2015. Retrieved November 16, 2017. ^ "Notre Dame Football :: UND.COM : The Official Site of Notre Dame Athletics". Und.com. Retrieved November 16, 2017. ^ Longman, Jere (October 15, 1995). "College Football – Notre Dame Stops Army 2 Feet Short of an Upset". Nytimes.com. Retrieved November 16, 2017. ^ "Notre Dame bowls over 5th-ranked USC, 38-10 No. 17 Irish stay alive in bid for Alliance spot, hand Trojans first loss". Articles.baltimoresun.com. Retrieved November 16, 2017. ^ "Notre Dame - Boston College Rivalry // The Holy War". Uhnd.com. November 20, 2015. Retrieved November 16, 2017. ^ "The Notre Dame Navy Football Rivalry // UHND.com". Uhnd.com. October 6, 2015. Retrieved November 16, 2017. ^ "College Football: Notre Dame Downs Air Force: Nonconference: Irish backup quarterback Krug uses ground attack for a 44-14 victory". LA Times. Associated Press. November 19, 1995. ^ "Bowl Championship Series - 1996 - Florida St. 31, Notre Dame 26". Espn.com. Retrieved November 16, 2017. ^ "1996 Notre Dame Fighting Irish Schedule and Results". College Football at Sports-Reference.com. Retrieved November 16, 2017. ^ "Notre Dame 14, Vanderbilt 7". Archives.chicagotribune.com. Retrieved November 16, 2017. ^ "1996 Notre Dame vs Vanderbilt". Saturdaydownsouth.com. June 8, 2014. Retrieved November 16, 2017. ^ "Football Games Notes - No. 21 Notre Dame". ^ Nobles, Charlie (September 22, 1996). "Notre Dame's Late Kick Leaves Texas Deflated". Nytimes.com. Retrieved November 16, 2017. ^ "Ohio State 29, Notre Dame 16". Archives.chicagotribune.com. Retrieved November 16, 2017. ^ "Football Returns Home To Face Washington In Notre Dame Stadium". Und.com. Retrieved November 16, 2017. ^ Press, From Associated (October 20, 1996). "Air Force Topples No. 8 Notre Dame in Overtime" – via LA Times. ^ "Notre Dame vs. Navy in Ireland Football: The first-ever Shamrock Classic is more than a game. It's a travel opportunity". Archives.baltimoresun.com. Retrieved November 16, 2017. ^ "Notre Dame 48, Boston College 21". Articles.chicagotribune.com. Retrieved November 16, 2017. ^ "Panthers Have No Luck Against No. 14 Irish, 60-6". ^ "Notre Dame 62, Rutgers 0". Archives.chicagotribune.com. Retrieved November 16, 2017. ^ "ABC Sports - Greatest games of the Notre Dame-USC rivarly(sic)". Espn.com. Retrieved November 16, 2017. ^ "Forced Into A Starting Position He Couldn't Handle, Rick Mirer Failed Miserably. Now, With Sunday's Cut Deadline Looming, One Question About Mirer Remains". Articles.chicagotribune.com. August 27, 1998. Retrieved May 28, 2017. ^ Shea, John (November 7, 2015). "Ex-49ers RB Ricky Watters shows there's life after football". SFGate. Retrieved May 28, 2017. ^ "Closing The Loop: Jaguars Chaplain Anthony Johnson | WJCT NEWS". News.wjct.org. February 12, 2016. Retrieved May 28, 2017. ^ Elizabeth Merrill (May 11, 1996). "Rodney Culver's family keeps legacy alive through former players' memories". Espn.com. Retrieved May 28, 2017. ^ "Ex-Packer Dorsey Levens enjoys, appreciates post-football second act". Espn.com. Retrieved November 16, 2017. ^ "Raghib Ismail Bio :: Notre Dame Football :: UND.COM :: The Official Site of Notre Dame Athletics". Und.com. Retrieved November 16, 2017. ^ "Jeff Burris Bio :: Notre Dame Football :: UND.COM :: The Official Site of Notre Dame Athletics". Und.com. Retrieved November 16, 2017. ^ "Bettis was a great player, but also a quitter". SBNation.com. August 6, 2015. Retrieved November 16, 2017. ^ "Where Are They Now? Irv Smith". Scout.com. Retrieved November 16, 2017. ^ "Reggie Brooks Bio UND.COM :: The Official Site of Notre Dame Athletics". Und.com. Retrieved November 16, 2017. ^ "Saints Flashback, Where Are They Now: Fullback Ray Zellars". SPORTS RADIO ESPN 1420. ^ "MAYES, DERRICK – Indiana Football Hall of Fame". Indiana-football.org. Retrieved November 16, 2017. ^ "Marc Edwards Bio :: Notre Dame Monogram Club :: UND.COM :: The Official Site of Notre Dame Athletics". ^ "Autry Denson Bio :: Notre Dame Football :: UND.COM :: The Official Site of Notre Dame Athletics". ^ "NFL.com Draft 2017 - NFL Draft History: Full Draft Year". NFL.com. Retrieved November 16, 2017. ^ a b "Notre Dame Media Guide:History and Records" (PDF). University of Notre Dame. Retrieved December 17, 2007. ^ Hodges, Jim (November 29, 1996). "A Case of the Bends : Lou Holtz Loved Notre Dame's Stage, but Roller Coaster Season May Have Been Too Much for Him" – via LA Times. ^ "Lou Holtz". August 14, 2014. ^ "South Carolina's Holtz announces retirement". Usatoday30.usatoday.com. Retrieved November 16, 2017. ^ Verdi, Bob (December 7, 1996). "Davie's Hiring Good Judgment Call By Irish". Chicago Tribune. ^ Layden, Tim. "This Old House As He Rebuilds at Notre Dame, Bob Davie Plans to Leave the Dome Golden. The Rest Is Up For Grabs". Si.com. Retrieved November 16, 2017. ^ "The University of New Mexico Lobos – 2015 Football Coaching Staff". Golobos.com. Retrieved November 16, 2017. ^ Lieberman, Richard. Personal Foul: Coach Joe Moore vs. The University of Notre Dame. Academy Chicago Publishers, 2001. ^ Press, From Associated (December 29, 1997). "Notre Dame Loses Rematch to LSU" – via LA Times. ^ "Irish Come Up Short Against Georgia Tech". AP. January 2, 1999 – via The New York Times. ^ "Bowl Championship Series – Oregon State 41, Notre Dame 9". Espn.com. Retrieved November 16, 2017. ^ Dame, ENR // MarComm:Web // University of Notre. "Irish Upset National Champs (1998 vs. Michigan) // Moments // 125 Football // University of Notre Dame". 125.nd.edu. ^ N, Bill. "Notre Dame vs. USC: The Best 25 Games in the Rivalry". ^ "ESPN.com: NCF – HuskerNation takes over Notre Dame Stadium". A.espncdn.com. Retrieved November 16, 2017. ^ "Oregon State blasts Irish in Fiesta". Usatoday30.usatoday.com. Retrieved November 16, 2017. ^ "5 Best Notre Dame Teams of the Post-Holtz Era - Her Loyal Sons". March 31, 2017. ^ "Notre Dame Wins 9th Straight National Title in Graduation Based on 2015 NCAA Graduation Success Rate Numbers". ^ a b c d e f Litsky, Frank (December 18, 1999). "Football – N.C.A.A. Puts Notre Dame Football on Probation". Nytimes.com. Retrieved November 16, 2017. ^ a b c d e "Irish Are Assessed Penalties". Washingtonpost.com. Retrieved November 16, 2017. ^ "Fighting Irish Football Coach Signs Contract Extension". ^ "Today in ND History: The first 0–3 start". Todayinndhistory.com. Retrieved November 16, 2017. ^ Dufresne, Chris (December 3, 2001). "Davie Fired By Irish" – via LA Times. ^ "Bob Davie Coaching Record". College Football at Sports-Reference.com. Retrieved November 16, 2017. ^ "ESPN.com: null - Bob Davie". Espn.com. Retrieved November 16, 2017. ^ "Bob Davie: At ESPN, I learned that every coach has problems". Coachingsearch.com. Archived from the original on August 7, 2016. Retrieved November 16, 2017. 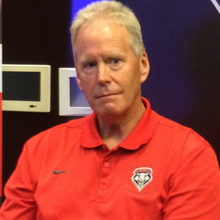 ^ "Davie hopes to stabilize program at New Mexico". Espn.com. Retrieved November 16, 2017. ^ "Notre Dame hires George O'Leary". UPI. Retrieved September 6, 2015. ^ Haugh, David (December 19, 2002). "By George, reporter carries on". Irish Sports Report. Archived from the original on September 28, 2007. Retrieved September 7, 2007. ^ Fountain, John W. (December 15, 2001). "Notre Dame Coach Resigns After 5 Days and a Few Lies". The New York Times. ^ "Over and out! Shortest coaching tenures – slide 8". Daily News. New York. ^ Press, Associated (December 9, 2003). "UCF hires O'Leary as new coach". Online Athens. Archived from the original on December 25, 2013. ^ "Notre Dame gives Stanford coach six-year deal". CNN. Archived from the original on January 3, 2002. ^ "2002 Notre Dame Fighting Irish Schedule and Results". College Football at Sports-Reference.com. Retrieved November 16, 2017. ^ "Michigan vs. Notre Dame – Game Summary – September 14, 2002 – ESPN". ESPN.com. Retrieved November 16, 2017. ^ "Notre Dame vs. Florida State – Game Summary – October 26, 2002 – ESPN". ESPN.com. Retrieved November 16, 2017. ^ "Boston College vs. Notre Dame – Game Summary – November 2, 2002 – ESPN". ESPN.com. Retrieved November 16, 2017. ^ "Notre Dame vs. USC – Game Recap – November 30, 2002 – ESPN". ESPN.com. Retrieved November 16, 2017. ^ "NC State vs. Notre Dame – Game Recap – January 1, 2003 – ESPN". ESPN.com. Retrieved November 16, 2017. ^ "Tyrone Willingham Coaching Record". College Football at Sports-Reference.com. Retrieved November 16, 2017. ^ "Notre Dame facing bevy of problems". WTHR. September 25, 2007. Retrieved November 28, 2007. ^ "Notre Dame vs. USC – Game Recap – November 27, 2004 – ESPN". ESPN.com. Retrieved November 16, 2017. ^ "Willingham fired by Notre Dame after three years". ESPN.com. November 30, 2004. Retrieved November 16, 2017. ^ Crouse, Karen (November 1, 2012). "With Football in Past, Tyrone Willingham Is at Peace". Nytimes.com. Retrieved November 16, 2017. ^ "Here's The Truth Behind The Meyer Hiring". ^ "Urban Meyer jilts Notre Dame, heads to Florida". Usatoday30.usatoday.com. Retrieved November 16, 2017. ^ a b "How to define Charlie Weis". Espn.com. Retrieved November 16, 2017. ^ "Weis to be introduced as Irish coach Monday". ESPN.com. Retrieved September 6, 2015. ^ "Weis to be introduced as Irish coach Monday". ESPN. December 13, 2004. Retrieved November 13, 2007. ^ "2005 Notre Dame Fighting Irish Schedule and Results". College Football at Sports-Reference.com. Retrieved November 16, 2017. ^ "Flashback: Ohio State Last Met Notre Dame in the 2006 Fiesta Bowl". December 13, 2015. ^ "Notre Dame vs. Pittsburgh – Game Summary – September 3, 2005 – ESPN". ESPN.com. Retrieved November 16, 2017. ^ a b "Notre Dame vs. Washington - Game Recap - September 24, 2005 - ESPN". ESPN.com. Retrieved November 16, 2017. 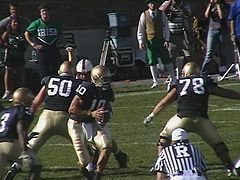 ^ "Brady Quinn Bio :: Notre Dame Football :: UND.COM :: The Official Site of Notre Dame Athletics". ^ Arnold, Keith. "Notre Dame Football: What If Jeff Samardzija Had Kept Playing Football?". ^ "Anthony Fasano Bio :: Notre Dame Football :: UND.COM :: The Official Site of Notre Dame Athletics". ^ "ND's Weis gets contract extension worth $30–40 million". ESPN.com. October 29, 2005. Retrieved November 16, 2017. ^ "Notre Dame Opens 2006 Season #2 in AP Poll // UHND.com". August 20, 2006. ^ "2006 Notre Dame Fighting Irish Schedule and Results". College Football at Sports-Reference.com. Retrieved November 16, 2017. ^ "Michigan vs. Notre Dame – Game Recap – September 16, 2006 – ESPN". ESPN.com. Retrieved November 16, 2017. ^ "Notre Dame vs. USC – Game Recap – November 25, 2006 – ESPN". ESPN.com. Retrieved November 16, 2017. ^ "Notre Dame vs. LSU – Game Recap – January 3, 2007 – ESPN". ESPN.com. Retrieved November 16, 2017. ^ "Schlabach: Notre Dame shows it doesn't belong in BCS bowls". ESPN.com. January 4, 2007. Retrieved November 16, 2017. ^ "2006 College Football Final Polls". Nationalchamps.net. Retrieved November 16, 2017. ^ Muratore, Mike. "Ranked For First Time Since 2006, Notre Dame Prays It Lives Up To Hype". Bleacher Report. Retrieved November 16, 2017. ^ "Seven Notre Dame Football Players Drafted into NFL; Four Others Sign Free Agent Contracts". und.cstv.com. April 30, 2007. Retrieved November 28, 2007. ^ "2007 Notre Dame Fighting Irish Schedule and Results". College Football at Sports-Reference.com. Retrieved November 16, 2017. ^ "All-Time Records for Notre Dame". stassen.com. Retrieved September 6, 2015. ^ "Notre Dame vs. Michigan – Game Recap – September 15, 2007 – ESPN". ESPN.com. Retrieved November 16, 2017. ^ "USC vs. Notre Dame – Game Recap – October 20, 2007 – ESPN". ESPN.com. Retrieved November 16, 2017. ^ "Notre Dame-Michigan: To The End". ^ "Navy vs. Notre Dame – Game Recap – November 3, 2007 – ESPN". ESPN.com. Retrieved November 16, 2017. ^ "2008 Notre Dame Fighting Irish Schedule and Results". College Football at Sports-Reference.com. Retrieved November 16, 2017. ^ "Syracuse vs. Notre Dame – Game Recap – November 22, 2008 – ESPN". ESPN.com. Retrieved November 16, 2017. ^ "Jimmy Clausen Bio :: Notre Dame Football :: UND.COM :: The Official Site of Notre Dame Athletics". ^ Scofield, Dan. "Jimmy Clausen: The Notre Dame Legend That Never Was". ^ "Notre Dame keeps Weis, though season 'fell short'". und.cstv.com. December 3, 2008. Retrieved December 3, 2008. ^ "Clausen sets ND records with 401 yards passing, 5 TDs in romp". espn.com. December 24, 2008. Retrieved December 24, 2008. ^ "Miami (Ohio) hires Notre Dame coordinator Haywood as coach". Usatoday30.usatoday.com. Retrieved November 16, 2017. ^ "Miami of Ohio hires Haywood from Notre Dame". ESPN.com. December 23, 2008. Retrieved November 16, 2017. ^ "Charlie Weis wrong face to represent Notre Dame". ^ Press, The Associated (October 30, 2010). "The Chiefs' Charlie Weis Is Coaching Through Pain". Nytimes.com. Retrieved November 16, 2017. ^ Smith, George (November 19, 2008). "Swarbrick: Didn't see Navy loss coming". espn.com. Retrieved November 27, 2008. ^ "Notre Dame vs. Michigan – Game Recap – September 12, 2009 – ESPN". ESPN.com. Retrieved November 16, 2017. ^ "USC vs. Notre Dame - Game Recap - October 17, 2009 - ESPN". ESPN.com. Retrieved November 16, 2017. ^ "Nevada vs. Notre Dame – Game Recap – September 5, 2009 – ESPN". ESPN.com. Retrieved November 16, 2017. ^ "Washington State vs. Notre Dame – Game Recap – October 31, 2009 – ESPN". ESPN.com. Retrieved November 16, 2017. ^ "Navy vs. Notre Dame - Game Recap - November 7, 2009 - ESPN". ESPN.com. Retrieved November 16, 2017. ^ "Notre Dame vs. Pittsburgh - Game Recap - November 14, 2009 - ESPN". ESPN.com. Retrieved November 16, 2017. ^ "Connecticut vs. Notre Dame - Game Recap - November 21, 2009 - ESPN". ESPN.com. Retrieved November 16, 2017. ^ "Notre Dame vs. Stanford - Game Recap - November 28, 2009 - ESPN". ESPN.com. Retrieved November 16, 2017. ^ "Notre Dame's Clausen decides to enter draft". ESPN.com. December 7, 2009. Retrieved November 16, 2017. ^ "Jack Swarbrick Press Conference Transcript (Nov. 30)". und.com. November 30, 2009. Retrieved November 30, 2009. ^ "Notre Dame paid Charlie Weis nearly $19 million to go away". ^ "Weis still earning more cash from ND than Kelly". ^ "Repost - Irish Stewed: Fun with Numbers // UHND.com". December 10, 2009. ^ "When it comes to George O'Leary's legacy at UCF ... it's complicated". ^ "Kelly: Notre Dame will 'go to work right away'". ESPN.com. December 11, 2009. Retrieved November 16, 2017. ^ "2010 Notre Dame Fighting Irish Schedule and Results". College Football at Sports-Reference.com. Retrieved November 16, 2017. ^ "Notre Dame student taping football practice dies". ESPN.com. October 27, 2010. Retrieved November 16, 2017. ^ "Tulsa vs. Notre Dame - Game Recap - October 30, 2010 - ESPN". ESPN.com. Retrieved November 16, 2017. ^ "Utah vs. Notre Dame – Game Recap – November 13, 2010 – ESPN". ESPN.com. Retrieved November 16, 2017. ^ "Notre Dame Stages a Revival at Yankee Stadium". The New York Times. November 21, 2010. ^ "Brian Kelly Named 29th Head Football Coach at Notre Dame". und.com. December 10, 2009. Retrieved December 10, 2009. ^ "Notre Dame Fighting Irish Football, Basketball, and Recruiting Front Page". scout.com. Retrieved September 6, 2015. ^ "Page Not Found". sunbowl.org. Retrieved September 6, 2015. ^ "South Florida vs. Notre Dame – Game Summary – September 3, 2011 – ESPN". ESPN.com. Retrieved November 16, 2017. ^ "Notre Dame vs. Michigan – Game Recap – September 10, 2011 – ESPN". ESPN.com. Retrieved November 16, 2017. ^ "Michigan State vs. Notre Dame – Game Recap – September 17, 2011 – ESPN". ESPN.com. Retrieved November 16, 2017. ^ "USC vs. Notre Dame – Game Recap – October 22, 2011 – ESPN". ESPN.com. Retrieved November 16, 2017. ^ "Navy vs. Notre Dame – Game Recap – October 29, 2011 – ESPN". ESPN.com. Retrieved November 16, 2017. ^ "Notre Dame Football Official Schedule :: Notre Dame Football :: UND.COM :: The Official Site of Notre Dame Athletics". und.com. Retrieved September 6, 2015. ^ "2011 Notre Dame Fighting Irish Schedule and Results". College Football at Sports-Reference.com. Retrieved November 16, 2017. ^ "Charley Molnar Hired As New UMass Football Head Coach". ^ "Chuck Martin Bio :: Notre Dame Football :: UND.COM :: The Official Site of Notre Dame Athletics". ^ "Notre Dame sports, except football, joins ACC". 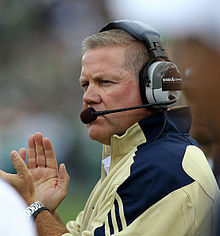 ^ "Brian Kelly Bio :: Notre Dame Football :: UND.COM :: The Official Site of Notre Dame Athletics". ^ "Notre Dame vs. USC – Game Recap – November 24, 2012 – ESPN". ESPN.com. Retrieved November 16, 2017. ^ "Alabama beats Notre Dame to win BCS championship game". Fox News. January 8, 2013. ^ "Golson: Suspension for poor judgment on test". ^ "2013 Notre Dame Fighting Irish Schedule and Results". College Football at Sports-Reference.com. Retrieved November 16, 2017. ^ "Notre Dame Beats Rutgers 29–16 in Pinstripe Bowl". cbslocal.com. Retrieved September 6, 2015. ^ "2013 NCAA College Football Polls and Rankings for Week 1 – ESPN". ESPN.com. Retrieved September 6, 2015. ^ Kay, Joe. "Miami (OH) hires Chuck Martin as football coach". ^ "Miami (OH) hires Chuck Martin as football coach". ^ "Notre Dame promotes Mike Denbrock to offensive coordinator". ^ OddsShark.com. "Notre Dame Fighting Irish vs. Florida State Seminoles Odds and Prediction". ^ a b "Notre Dame 2014 Schedule – Fighting Irish Home and Away – ESPN". ESPN.com. Retrieved September 6, 2015. ^ "Notre Dame vs. Navy – Game Recap – November 1, 2014 – ESPN". ESPN.com. Retrieved November 16, 2017. ^ "2014 Notre Dame Fighting Irish Schedule and Results - College Football at Sports-Reference.com". College Football at Sports-Reference.com. Archived from the original on December 26, 2016. ^ Arnold, Keith. "Notre Dame Football: Can Brian Kelly Reboot His Coaching Staff Again?". ^ "Mike Sanford Bio :: Notre Dame Football :: UND.COM :: The Official Site of Notre Dame Athletics". ^ "BlueAndGold.com – Predictions For The 2016 Notre Dame Offense". August 27, 2016. ^ "2015 Notre Dame Fighting Irish Schedule and Results". College Football at Sports-Reference.com. Retrieved November 16, 2017. ^ "Notre Dame vs. Ohio State – Game Recap – January 1, 2016 – ESPN". ESPN.com. Retrieved November 16, 2017. ^ "2016 Notre Dame Fighting Irish Schedule and Results". College Football at Sports-Reference.com. Retrieved November 16, 2017. ^ "Notre Dame vs. Texas - Game Summary - September 4, 2016 - ESPN". ESPN.com. Retrieved November 16, 2017. ^ "Duke vs. Notre Dame - Game Recap - September 24, 2016 - ESPN". ESPN.com. Retrieved November 16, 2017. ^ Hamilton, Brian. "VanGorder firing won't fix Notre Dame's real issue". ^ "Notre Dame hires Mike Elko as new defensive coordinator". ^ "Notre Dame vs. NC State – Game Recap – October 8, 2016 – ESPN". ESPN.com. Retrieved November 16, 2017. ^ "Notre Dame's Brian Kelly calls snapping atrocious, Michigan recruit trolls him". ^ Skrbina, Paul. "Notre Dame QB DeShone Kizer declares for NFL draft". ^ Skrbina, Paul. "Malik Zaire to get release from Notre Dame; could end up at Wisconsin". ^ "Western Kentucky names Irish OC Sanford coach". Espn.com. Retrieved November 16, 2017. ^ "Notre Dame hires Chip Long from Memphis to be next offensive coordinator". Ustoday.com. Retrieved November 16, 2017. ^ Skrbina, Paul. "Mike Denbrock latest coach to leave Notre Dame football". Chicagotribune.com. Retrieved November 16, 2017. ^ "Source: Cincinnati lures Notre Dame's Denbrock". Espn.com. Retrieved November 16, 2017. ^ "Notre Dame AD says Brian Kelly to return in 2017". Si.com. Retrieved November 16, 2017. ^ "2017 Notre Dame Fighting Irish Schedule and Results | College Football at Sports-Reference.com". College Football at Sports-Reference.com. Retrieved April 11, 2018. ^ "USC vs. Notre Dame - Game Summary - October 21, 2017 - ESPN". ESPN.com. Retrieved April 11, 2018. ^ "NC State vs. Notre Dame - Game Summary - October 28, 2017 - ESPN". ESPN.com. Retrieved April 11, 2018. ^ "Notre Dame vs. Miami - Game Summary - November 11, 2017 - ESPN". ESPN.com. Retrieved April 11, 2018. ^ "ND Nation » Ian to Miles Means Victory for Irish". ndnation.com. Retrieved April 11, 2018. ^ Somogyi, Lou (December 3, 2012). "ND-Alabama Titles: For The Record". Blue & Gold Illustrated. Retrieved December 20, 2012. ^ "CFB Data Warehouse 1953 National Champion Selections". cfbdatawarehouse.com". Retrieved October 10, 2018. ^ "CFB Data Warehouse Notre Dame Recognized National Champions". cfbdatawarehouse.com". Retrieved December 20, 2012. ^ "ncaa.com: Championship History". Retrieved December 20, 2012. ^ "Championship History-FBS". Retrieved December 20, 2012. ^ "Notre Dame is still No. 1, according to one BCS computer". Retrieved January 3, 2018. ^ "Notre Dame AP Football Poll Summary – College Poll Archive – Historical College Football and Basketball Polls and Rankings". collegepollarchive.com. Retrieved September 6, 2015. ^ a b c d e f g h "The All-Time Team – Compiled by Ted Gangi and Josh Yonis" (PDF). ^ a b "Notre Dame Wins 2017 Joe Moore Award As Most Outstanding Offensive Line Unit". Joe Moore Award. December 19, 2017. ^ "College Football Research:Notre Dame now first in all-time winning percentage". CFR. ^ "Notre Dame Drafted Players/Alumni". pro-football-reference.com. Retrieved August 31, 2015. ^ "All Time Division I-A Wins". cfbdatawarehouse.com. Retrieved April 15, 2004. ^ "Division I-A All Time Wins and Losses by games played". cfbdatawarehouse.com. Retrieved June 11, 2010. ^ "Notre Dame Yearly Totals". cfbdatawarehouse.com. Retrieved December 25, 2008. ^ "Manti Te'o Named 33rd Unanimous All-American in School History". und.com. October 13, 2012. Retrieved November 19, 2012. ^ a b "Hall of Famers: Select 'Group by School'". Retrieved December 17, 2007. ^ "University of Notre Dame – Best College – Education – US News". Retrieved August 25, 2010. ^ Jackson, Derrick Z. (December 6, 2006). "College football's winners and losers". The Boston Globe. Retrieved January 2, 2008. ^ "Notre Dame's NCAA-record 43-game win streak over Navy ends". espn.com. Retrieved April 24, 2008. ^ a b "This Day in History 1957: Notre Dame ends Oklahoma record winning streak". history.com. Archived from the original on February 26, 2009. Retrieved April 20, 2008. ^ "FCS foes are weak, not cheap". U-T San Diego. September 11, 2009. ^ "No. 1 vs. No. 2". Retrieved April 21, 2008. ^ a b Pete Fiutak; Richard Cirminiello; John Harris; Matthew Zemek (August 28, 2006). "CFN's Tuesday Question – The All-Time Greatest Regular Season Games". sportingnews.com. scout.com. Archived from the original on August 21, 2008. Retrieved April 20, 2008. ^ a b c d e Walters, John (July 21, 2004). Notre Dame Golden Moments. Rutledge Hill Press. ISBN 1-59186-042-3. ^ Unknown, Unknown (November 3, 1913). "Teams Showing More Open Play – Notre Dame's Game Proves Great Possibilities of the Forward Pass". The New York Times. Retrieved October 15, 2008. ^ Helwagen, Steve (December 11, 2005). "OSU-ND 1935: "The Game of the Century"". scout.com. Retrieved April 20, 2008. ^ Gietschier, Steve (September 25, 1995). "Awakening the echoes. (Notre Dame-Ohio State football)". sportingnews.com. encyclopedia.com. Archived from the original on January 12, 2009. Retrieved April 20, 2008. ^ "The New York Times: This Day in Sports: Irish Spoil the Sooner's Party". nytimes.com. Retrieved April 21, 2008. ^ a b c Bob Boyles & Paul Guido (September 1, 2005). Fifty Years of College Football. Sideline Communications. ISBN 0-9755684-0-X. ^ Burns, Marty (July 17, 2007). "Catholics vs. Convicts The Irish pulled out a gritty win over a bitter foe". si.com. Archived from the original on August 11, 2007. Retrieved April 20, 2008. ^ "College football's best of the last 20 years". usatoday.com. November 19, 2002. Retrieved April 20, 2008. ^ Mike Duffy & Andrew Heitner (November 19, 1993). "Irish win game of the century". The Tech (MIT Newspaper). mit.edu. Retrieved April 20, 2008. ^ "Notre Dame's NCAA-record 43-game win streak over Navy ends". ESPN. November 3, 2007. Archived from the original on November 5, 2007. Retrieved November 3, 2007. ^ Pete Fiutak; Richard Cirminiello; John Harris; Matthew Zemek (September 5, 2006). "Tuesday Question ... The Ten Greatest Bowl Games of All-Time". sportingnews.com. scout.com. Archived from the original on December 11, 2006. Retrieved April 20, 2008. ^ "The List: Greatest bowl games". espn.com. espn.com. Retrieved April 20, 2008. ^ "Win percentage computation form". stassen.com. Retrieved September 6, 2015. ^ "Notre Dame Historical Data". College Football Data Warehouse. Archived from the original on October 3, 2002. Retrieved June 28, 2006. ^ a b Jenkins, Dan (1969). "Knute Rockne Would Have Agreed, Ara". Sports Illustrated. Time-Life, Inc. 31 (26): 26. Archived from the original on March 26, 2012. Retrieved June 14, 2012. ^ "With Chicago next, Notre Dame 'Shamrock Series' games here to stay". tribunedigital-chicagotribune. Retrieved September 6, 2015. ^ "Notre Dame's Shamrock Series adds flavor to neutral-site games". Irish247. Retrieved September 6, 2015. ^ patrick_hayes. "Notre Dame's Jack Swarbrick: New Uniforms Will Give Special Feel To 'Shamrock Series' Games". SB Nation Chicago. Vox Media. Retrieved September 6, 2015. ^ "2009 Heisman Trophy vote totals". Al.com. Retrieved December 13, 2009. ^ a b c d "The Maxwell Award Collegiate Player of the Year: Past Recipients". The Maxwell Football Club. Archived from the original on February 14, 2009. Retrieved January 2, 2008. ^ "The Maxwell Award College Player of the Year: Brady Quinn, University of Notre Dame". The Maxwell Football Club. Archived from the original on June 22, 2007. Retrieved January 2, 2008. ^ "Walter Camp Football Foundation Awards (Page 3)". The Walter Camp Foundation. Archived from the original on February 4, 2010. Retrieved January 2, 2008. ^ a b c "Walter Camp Football Foundation Awards (Page 2)". The Walter Camp Football Foundation, Inc. Archived from the original on June 9, 2008. Retrieved January 2, 2008. ^ a b "Past Winners". The Golden Arm Foundation. Archived from the original on December 16, 2007. Retrieved January 2, 2008. ^ a b "Sammy Baugh Trophy Recipients". Touchdown Club of Columbus. Archived from the original on October 16, 2007. Retrieved January 2, 2008. ^ "Golden Tate Wins Biletnikoff Award, Named Walter Camp First Team All-American". University of Notre Dame. December 10, 2009. Retrieved December 10, 2009. ^ "Tyler Eifert of Notre Dame Named 2012 John Mackey Award Recipient". johnmackeyaward.org. Retrieved December 5, 2012. ^ "Butkus Award Past Winners". thebutkusaward.com. December 3, 2012. Retrieved December 3, 2012. ^ "Notre Dame's Te'o wins Butkus Award". chicagotribune.com. December 3, 2012. Retrieved December 3, 2012. ^ "Butkus Award Past Winners". thebutkusaward.com. December 9, 2015. Retrieved December 9, 2015. ^ a b c d e "Winners & Finalists". Rotary Club of Houston. Archived from the original on January 8, 2009. Retrieved January 2, 2008. ^ "College football: Notre Dame's Manti Te'o wins Lott Trophy". DeseretNews.com. December 9, 2012. Retrieved September 6, 2015. ^ a b c "All-Time Outland Trophy Winners". Football Writers Association of America. Retrieved January 2, 2008. ^ "Ronnie Stanley Named 2015 Polynesian College Football Player of the Year". University of Notre Dame. December 8, 2015. Retrieved December 16, 2015. ^ "Wuerffel Trophy Winners". Retrieved December 4, 2018. ^ a b "Paul "Bear" Bryant College Football Coaching Awards" (PDF). The American Heart Association. Archived from the original (PDF) on December 2, 2007. Retrieved November 21, 2007. ^ a b c "Eddie Robinson Coach of the Year Award". Football Writers Association of America. Retrieved January 2, 2008. ^ "Notre Dame's Brian Kelly wins Eddie Robinson Award". ESPN.com. Retrieved September 6, 2015. ^ "Tyrone Willingham Named Home Depot National Coach of the Year". UND.cstv.com. December 9, 2002. Retrieved January 2, 2008. ^ Ralph D. Russo (December 5, 2012). "Kelly named coach of the year". Fort Wayne Journal-Gazette. Retrieved December 5, 2012. ^ Krausz, Tony (December 19, 2012). "Brian Kelly named Walter Camp Coach of the Year". Associated Press. Archived from the original on December 14, 2013. Retrieved December 19, 2012. ^ "Coach of the Year". coachoftheyear.com. Archived from the original on January 10, 2002. Retrieved September 6, 2015. ^ Brady, James (January 3, 2013). "Notre Dame's Kelly wins AP coach of the year". SB Nation. Retrieved January 5, 2013. ^ "Bob Diaco Captures Broyles Award As Nation's Top Assistant Coach". UND.cstv.com. December 4, 2012. Retrieved December 4, 2012. ^ "Notre Dame Football Team to Wear Throwback Uniforms Against USC". cstv.com. Retrieved September 6, 2015. ^ a b c "ND Archives: All-Time Roster". und.cstv.com. Retrieved May 6, 2008. ^ "Sporting News College Football Cathedrals". MSNBC. Archived from the original on September 12, 2001. Retrieved January 30, 2007. ^ Walters, John (October 13, 2005). "Does it get any better than this?". si.com. Archived from the original on May 9, 2006. Retrieved April 24, 2008.